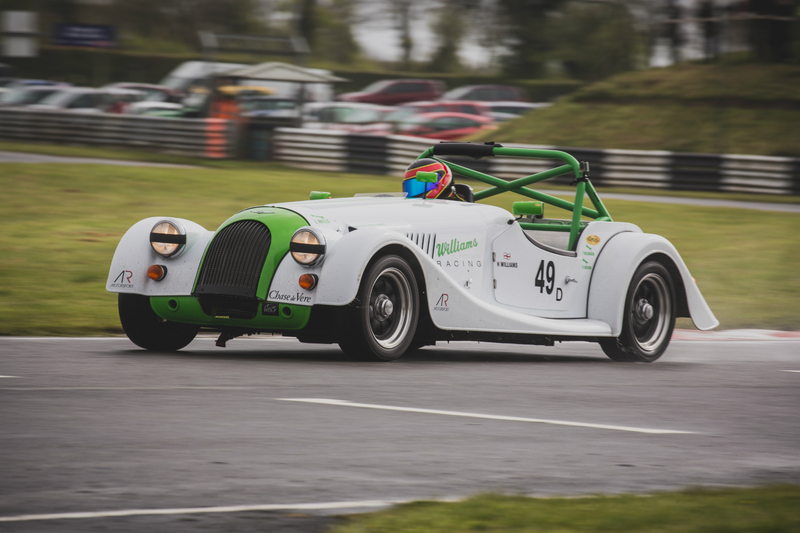 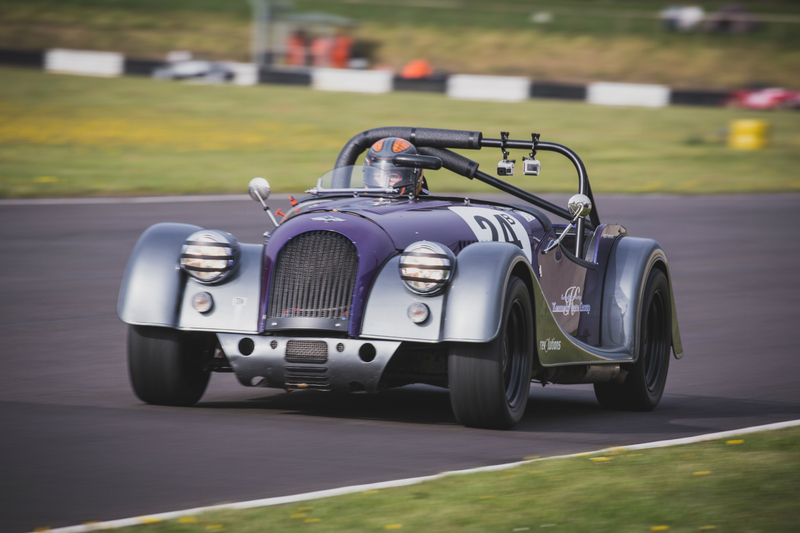 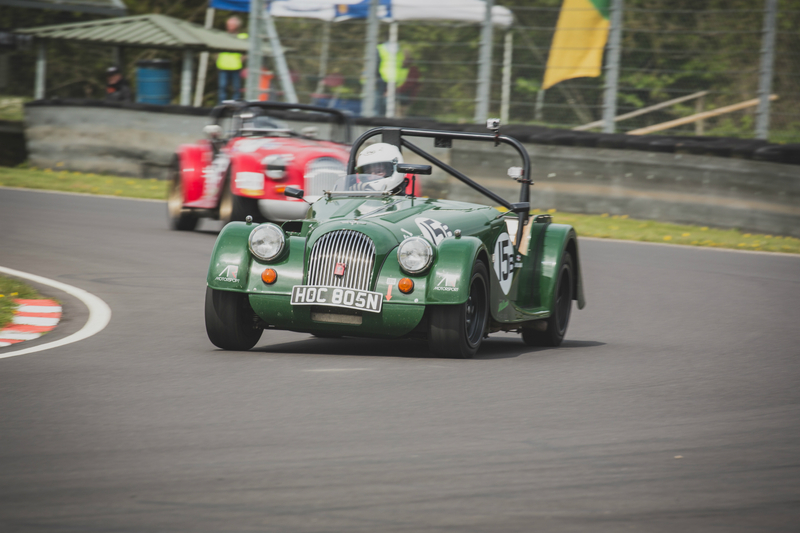 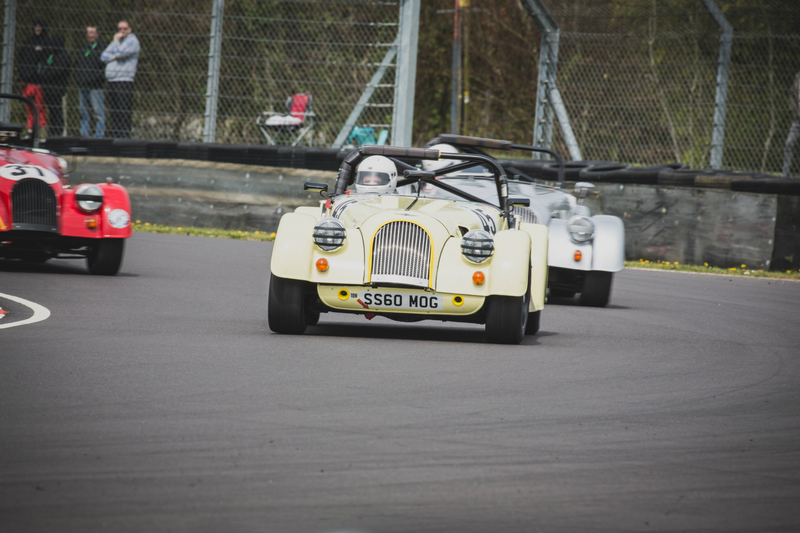 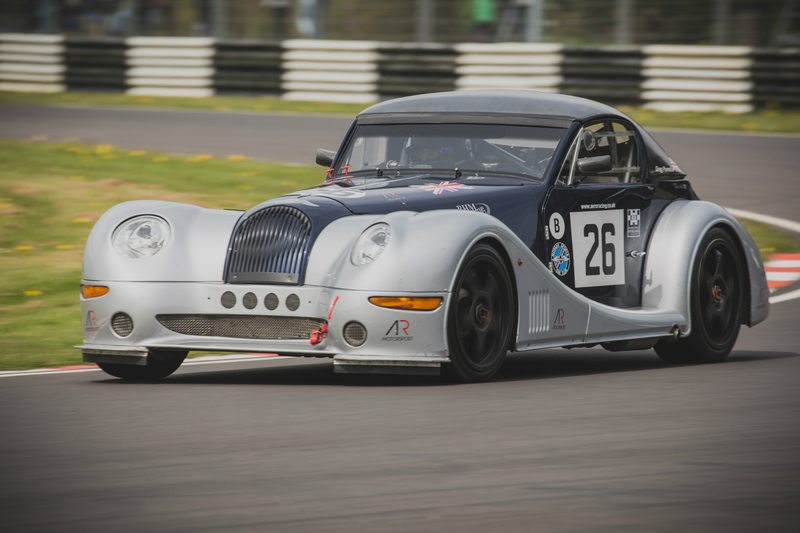 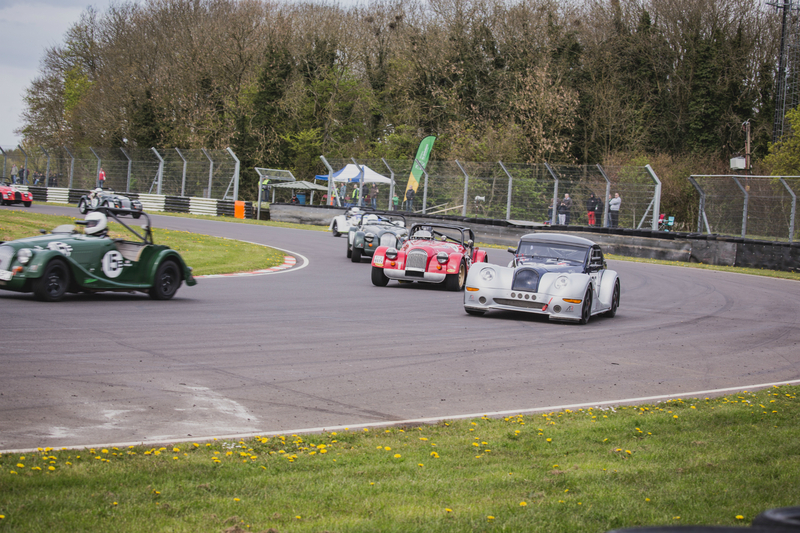 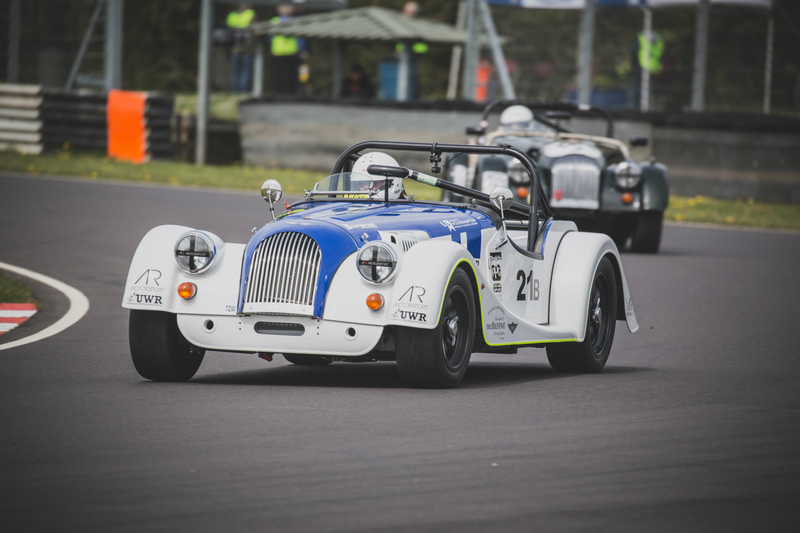 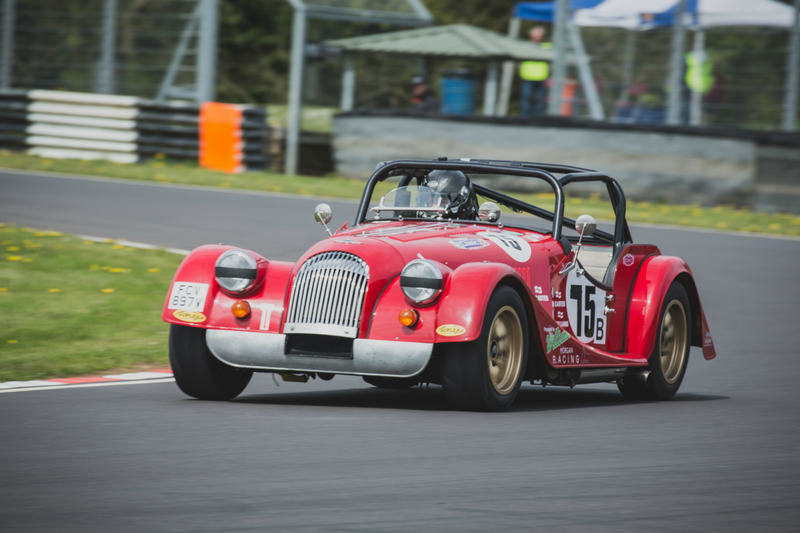 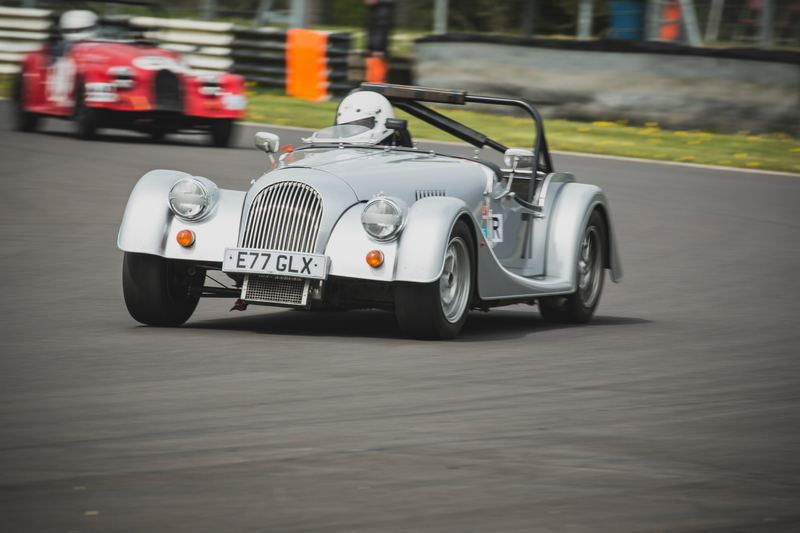 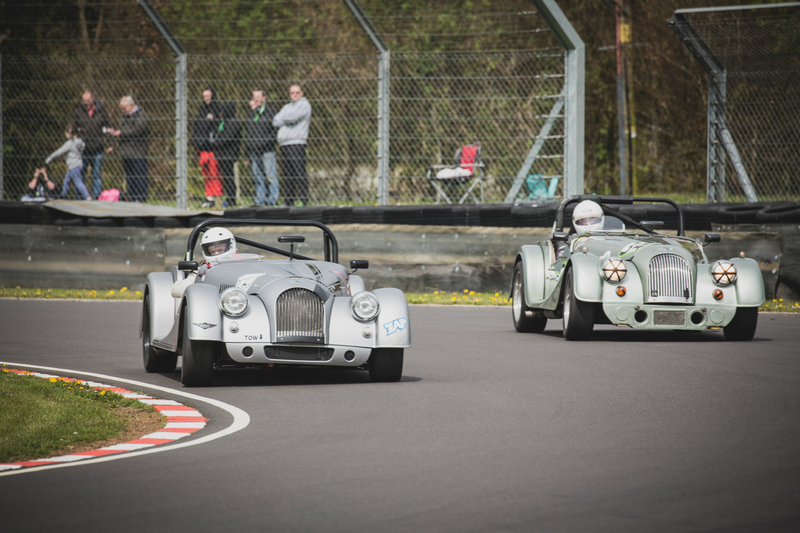 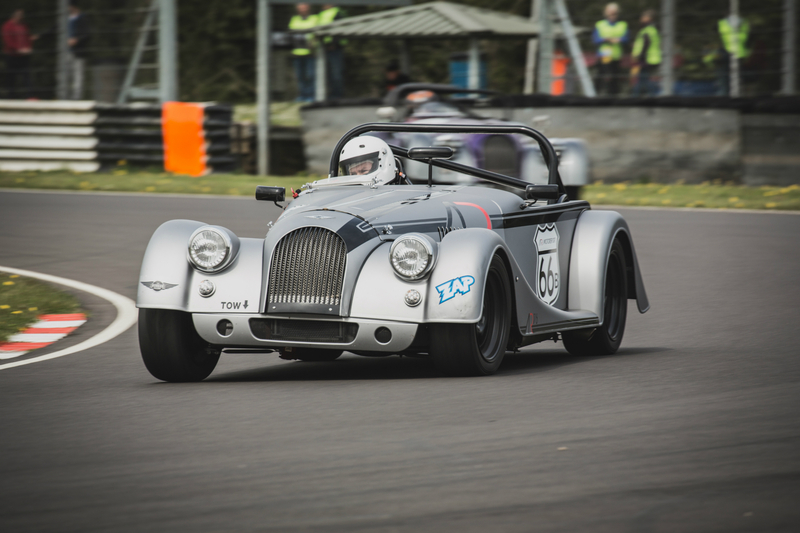 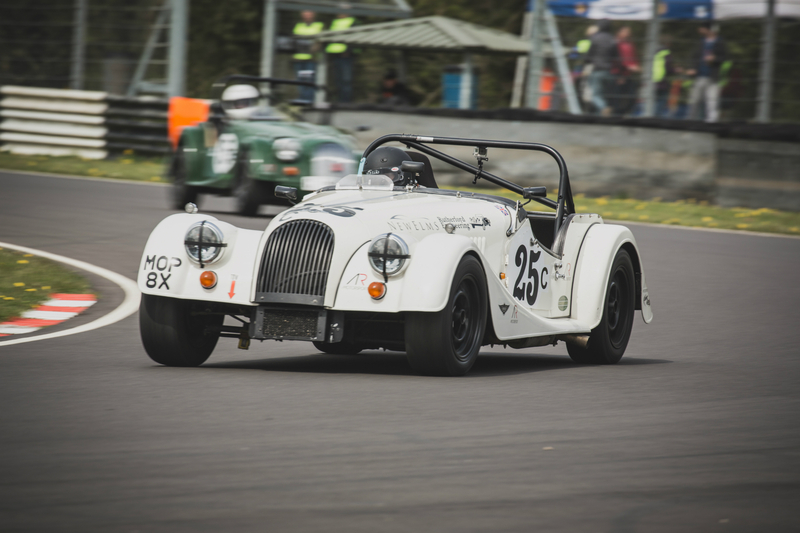 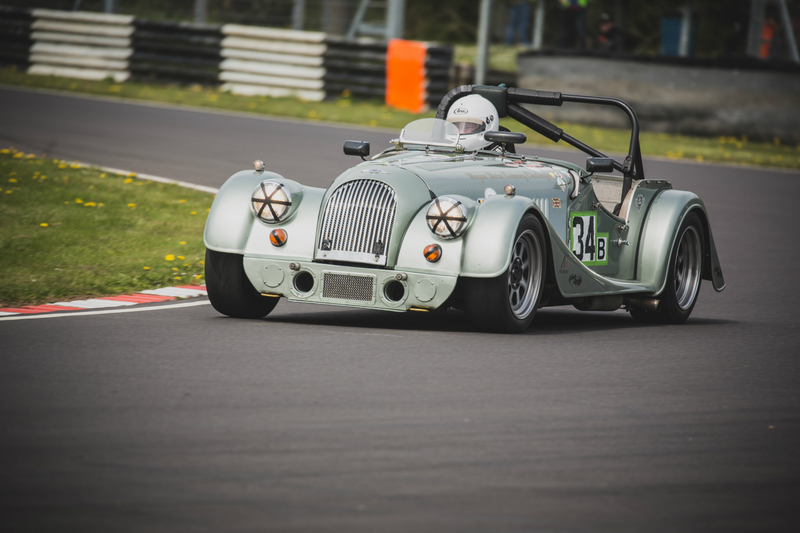 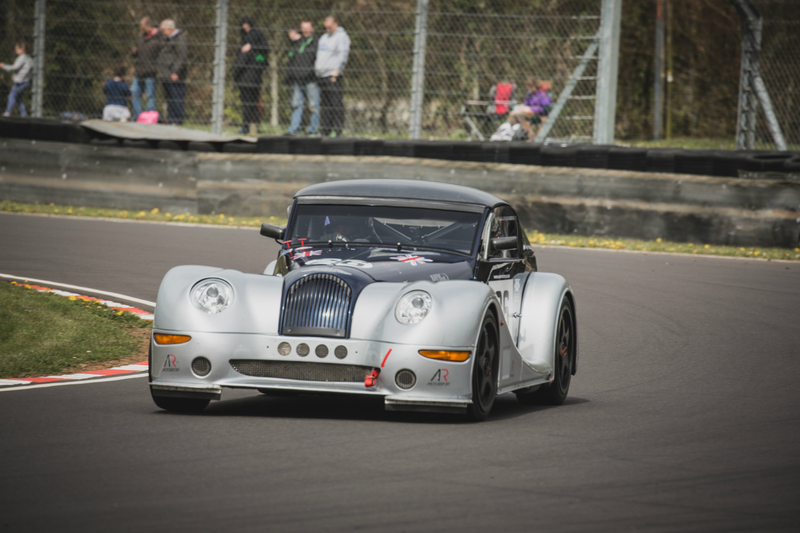 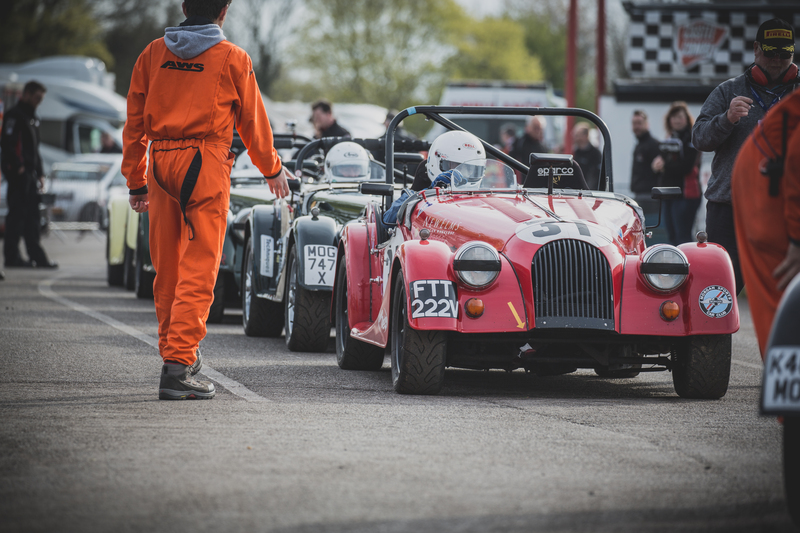 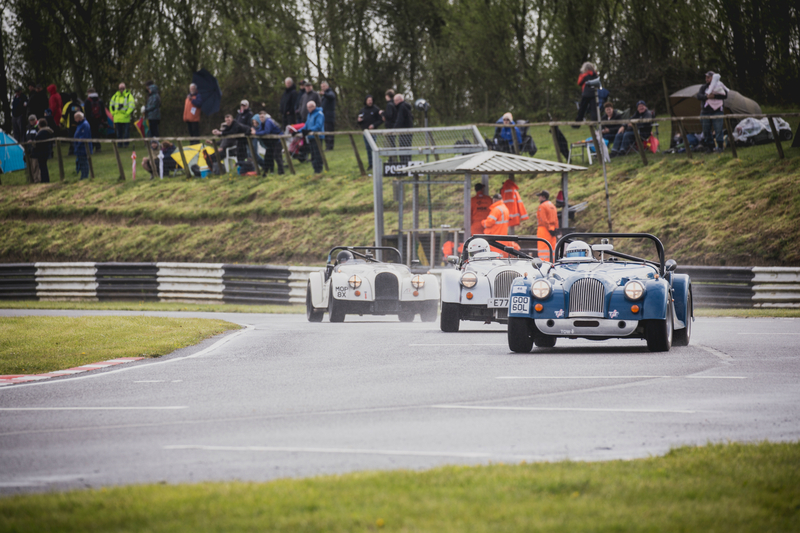 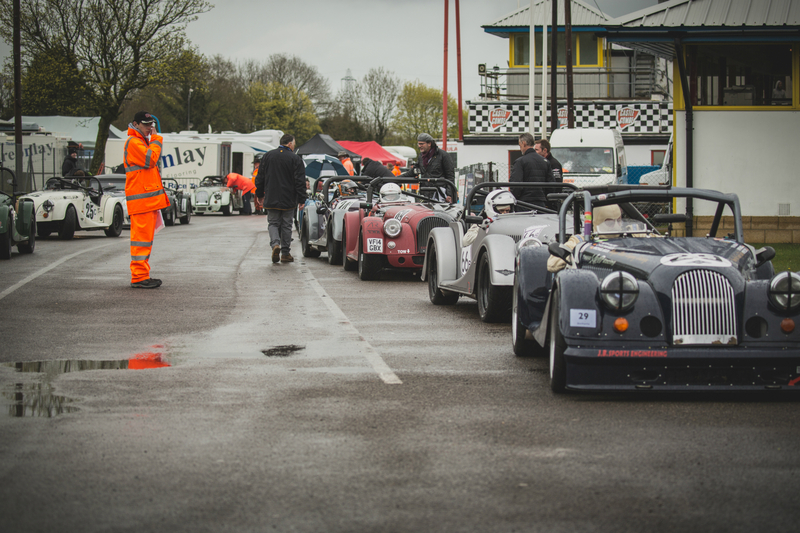 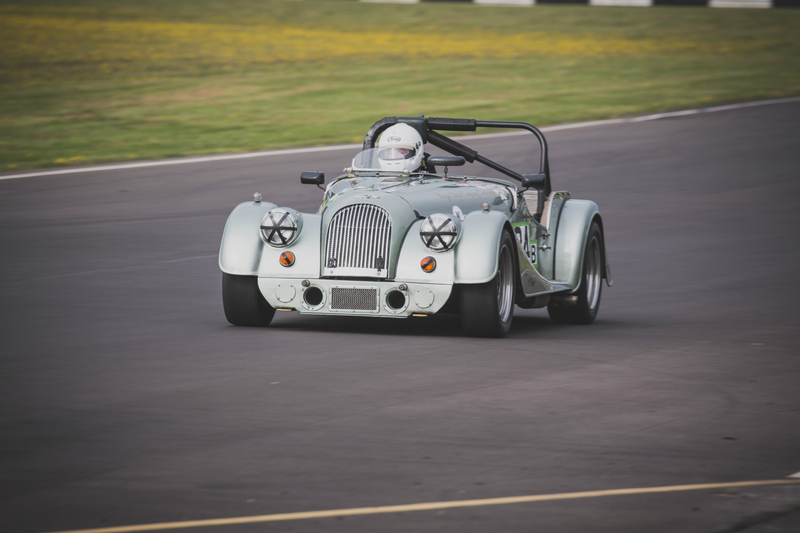 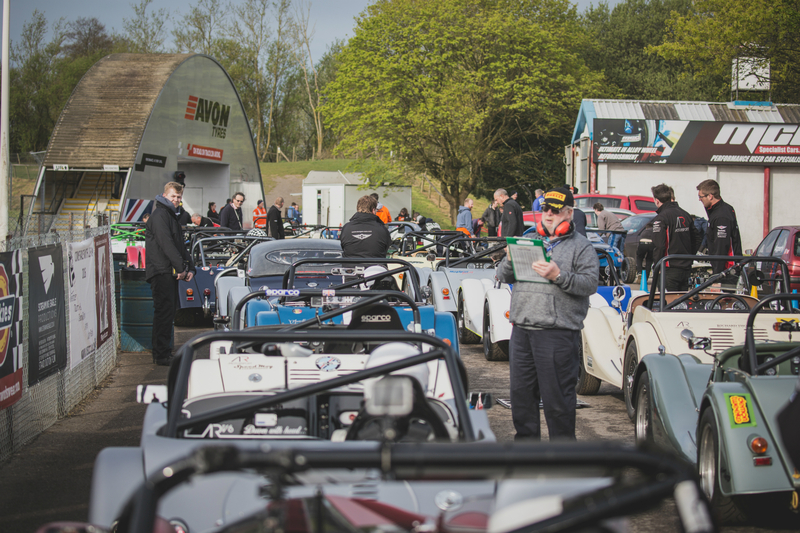 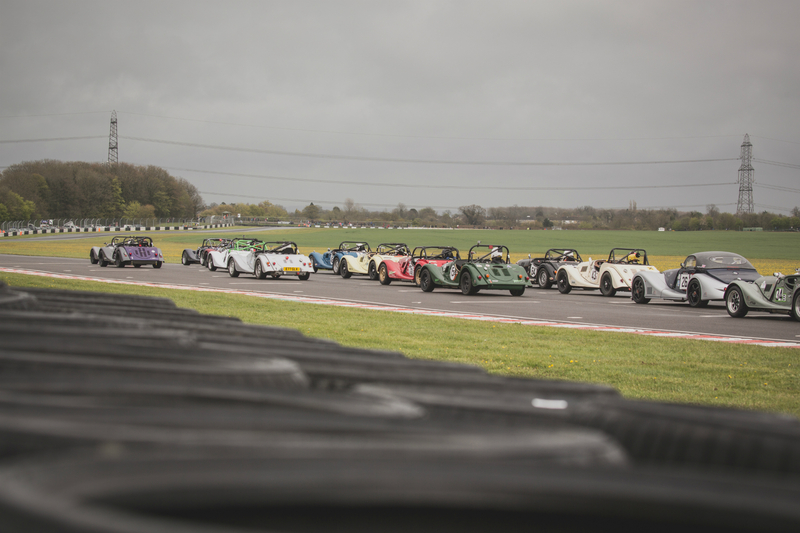 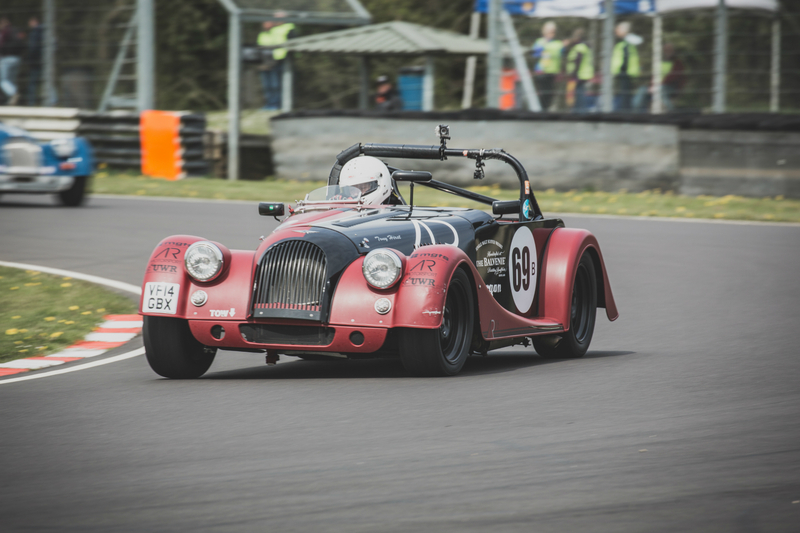 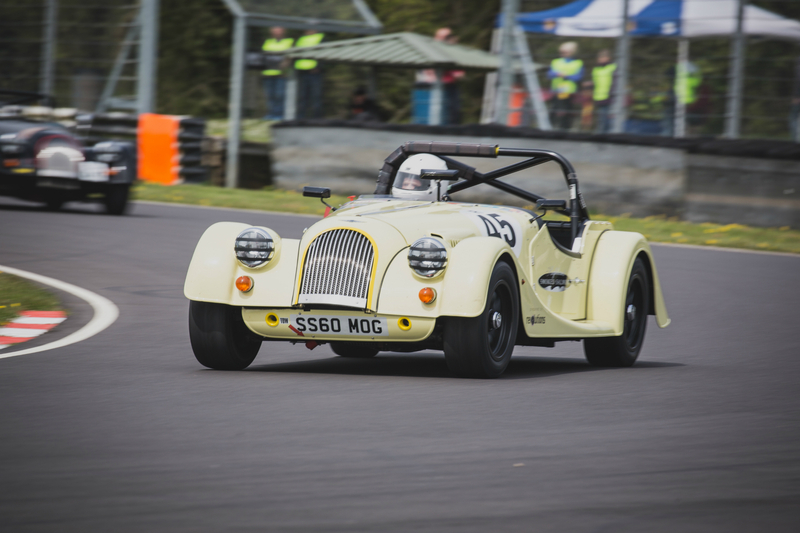 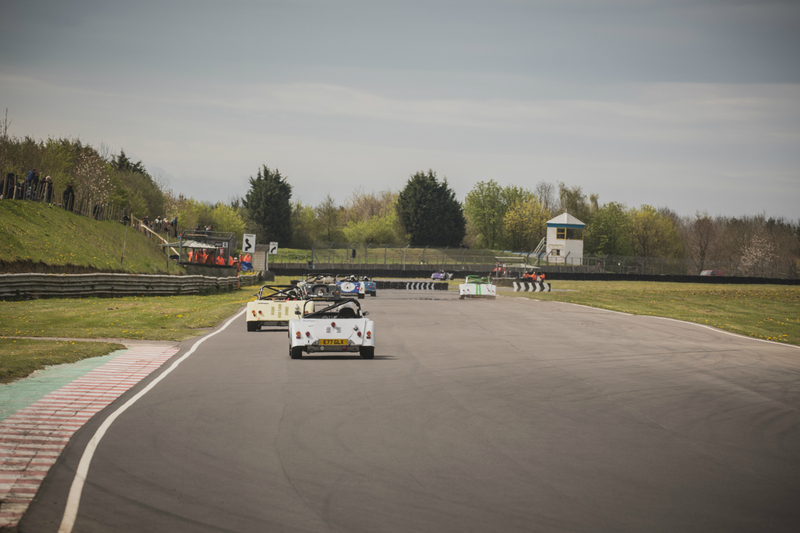 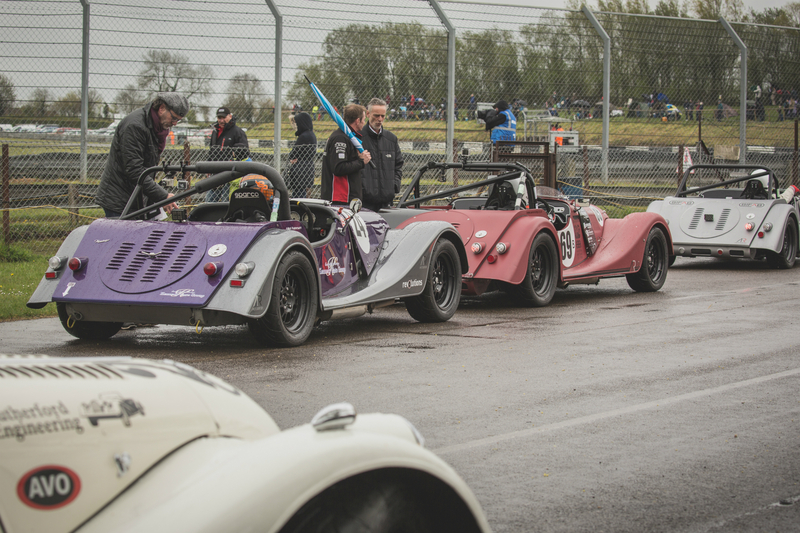 A 20 car grid headed to an ever challenging Castle Combe circuit on Bank Holiday Monday (2/5/16) for round 3 of the AR Motorsport Morgan Challenge Series. 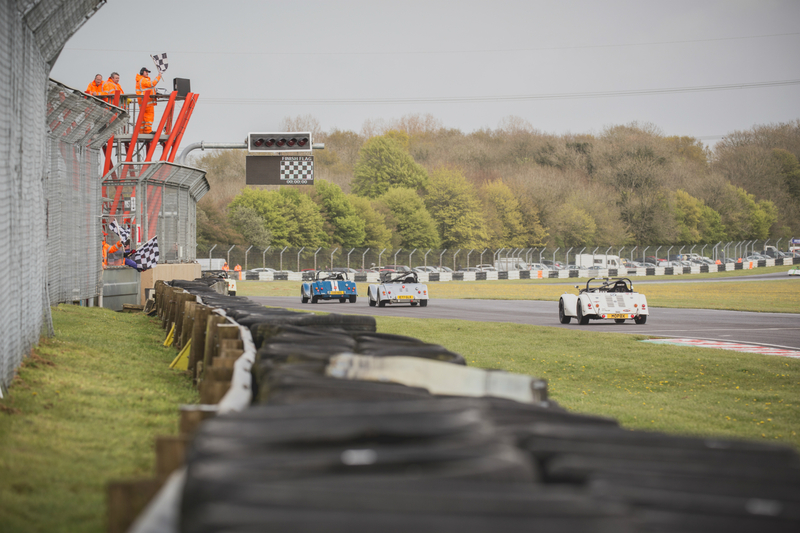 Racing as part of the BARC meeting, two races were on the cards, with the second televised live on Motors TV. 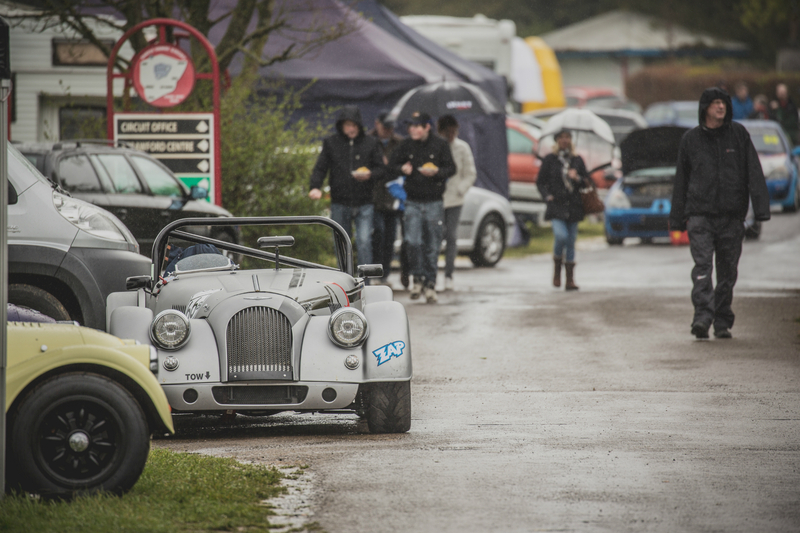 Ever-changing weather provided some challenging conditions and exciting racing throughout the day. 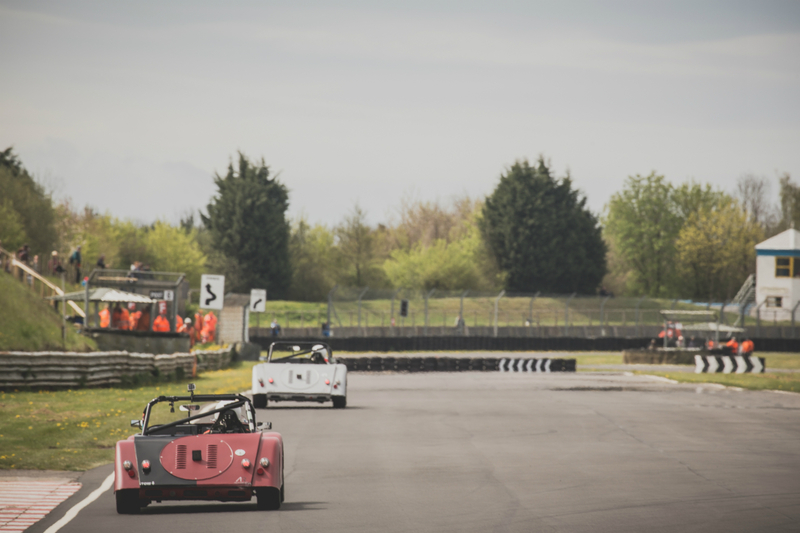 The first race was a non-televised affair, but one that would provide championship points for the top finishers. 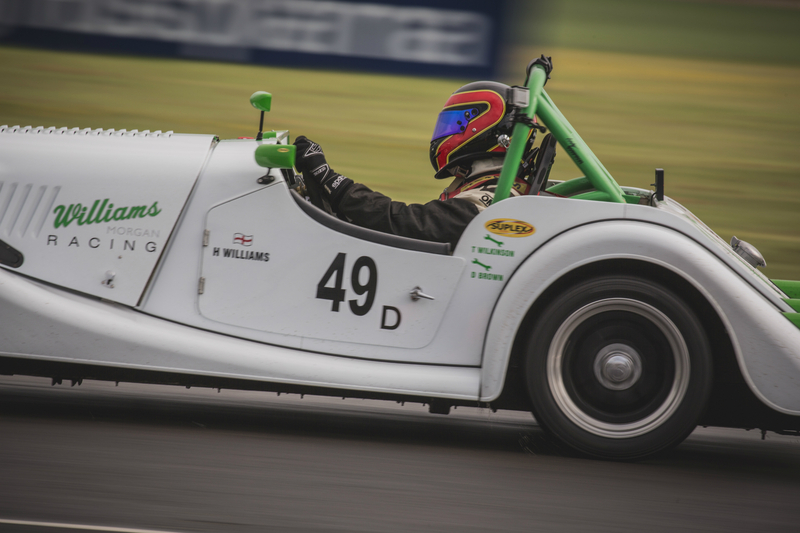 It was no surprise to see Keith Ahlers put his Plus 8 on pole position in a dry qualifying session that saw an unfortunate off for Stuart Anderson in the latest ARV6. 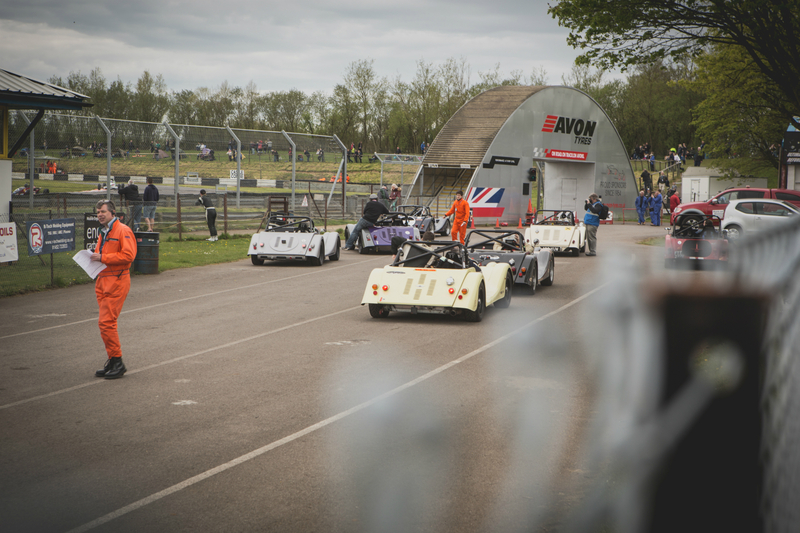 Also in ARV6s, Andrew Thompson and Tony Hirst looked to be going well and qualified in 3rd and 4th position, only beaten by Elliot Paterson who once again qualified impressively to start the race from the front row in 2nd. 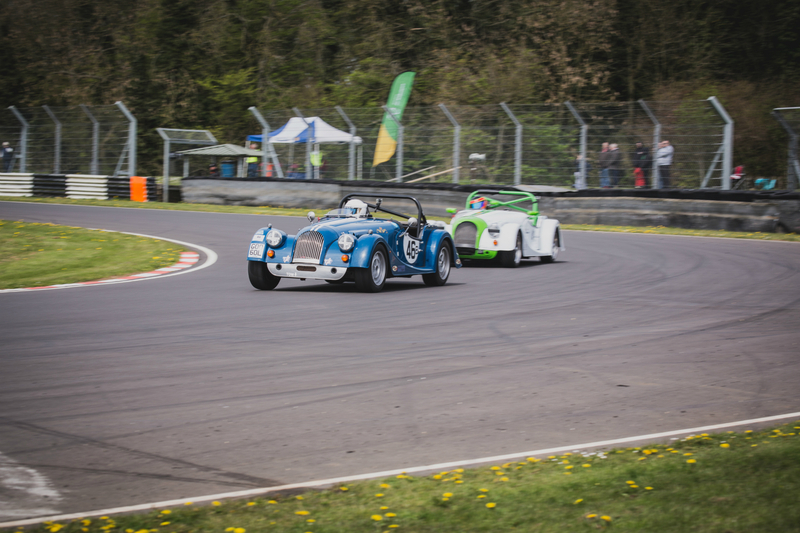 On to the race and still no sign of rain as the only Class A car on the grid, Keith Ahlers, took advantage of a dry track and disappeared off into the distance within the first few corners. 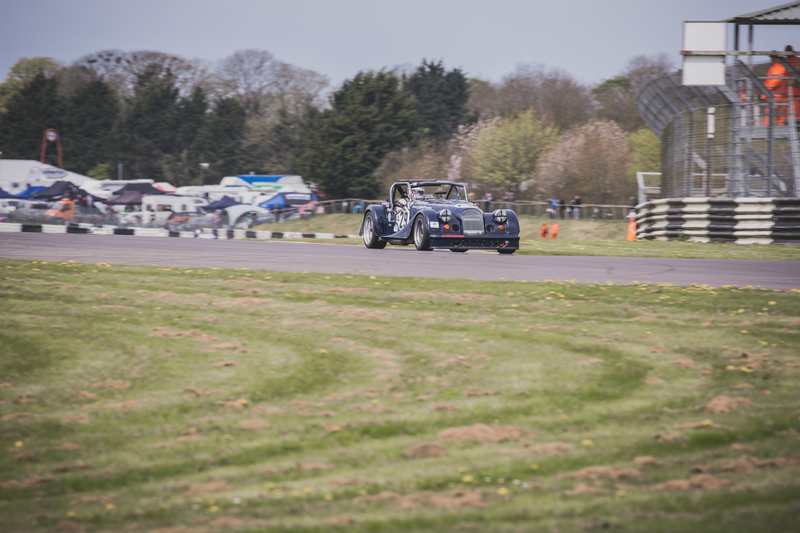 A slight issue for Elliot Paterson’s V6 saw him drop a couple of positions allowing Andrew Thompson and Tony Hirst through, both were flying but Andrew managed to put clear daylight between the two and claimed Class B victory, his first of the season. 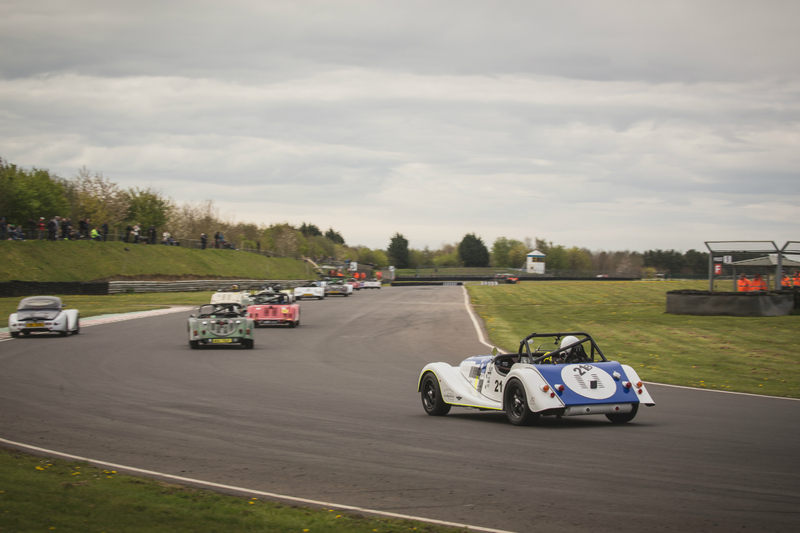 A composed race for Henry Williams on his home circuit saw him finish in 6th overall taking the Class D victory and fastest lap. 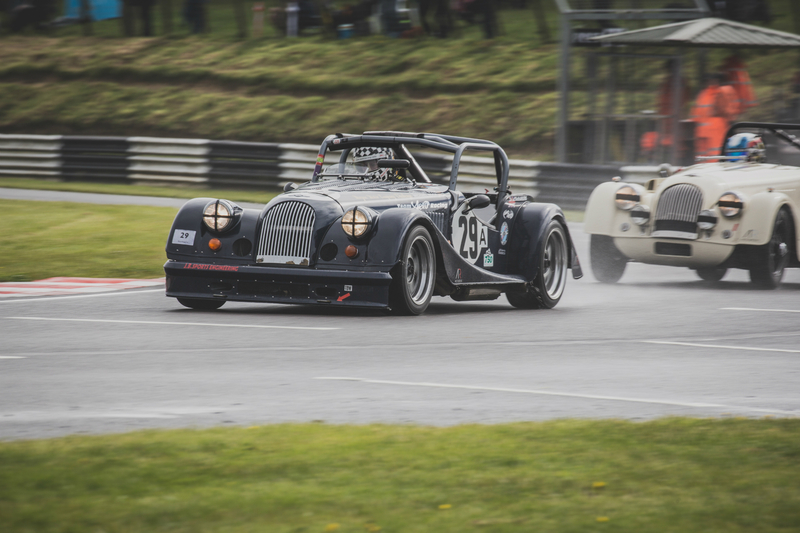 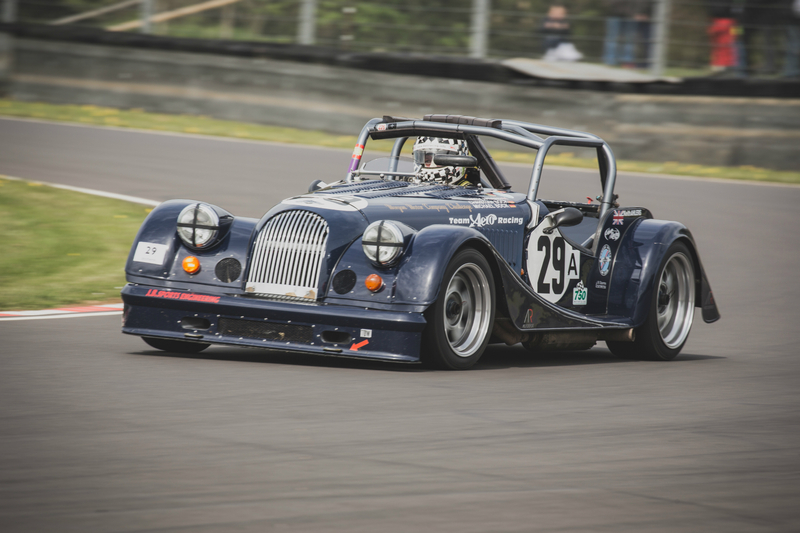 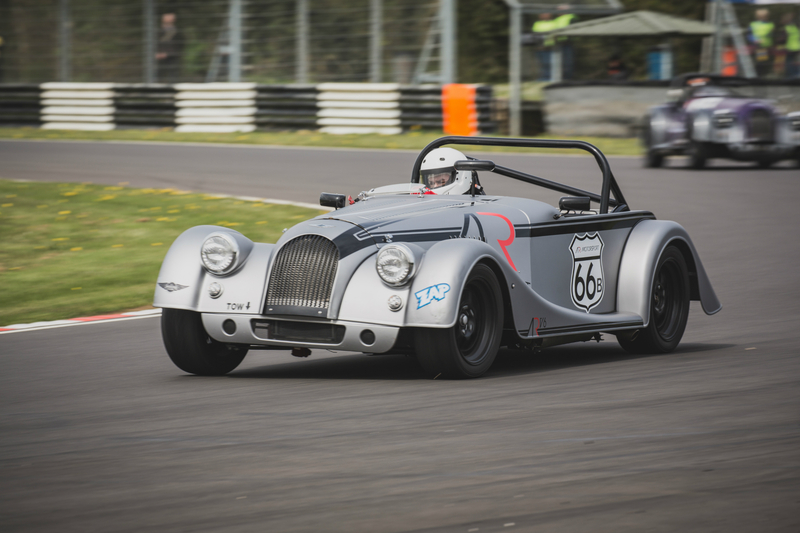 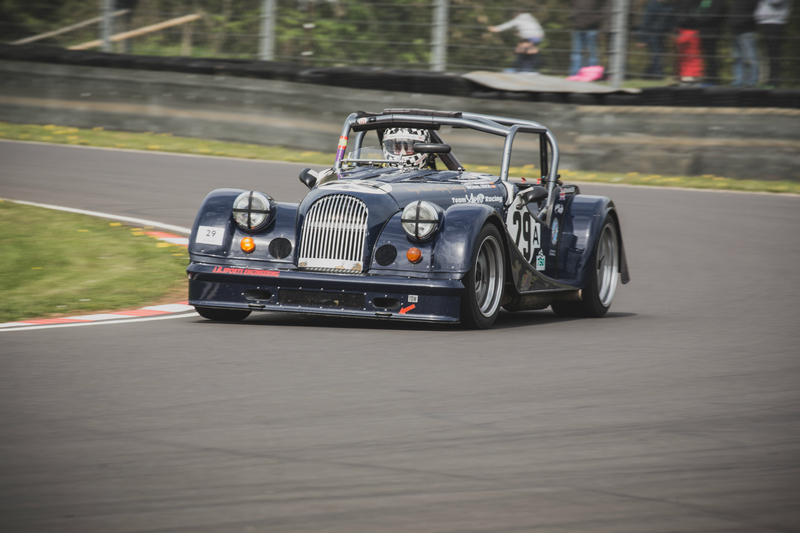 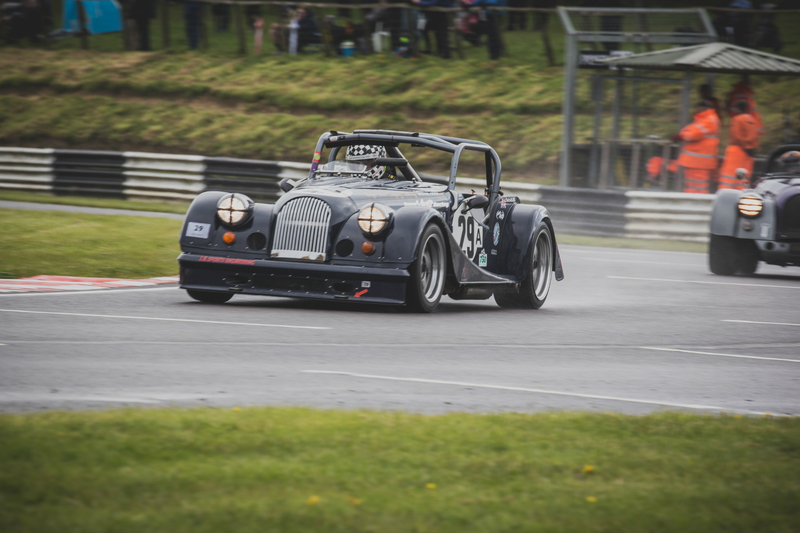 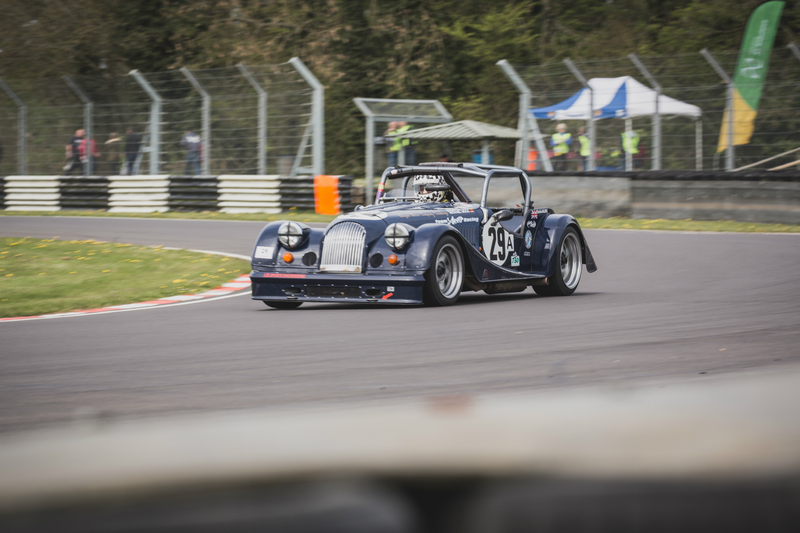 Class R was hotly contested between Tim Parsons and Kelvin Laidlaw, with just under a second between the two across the line. 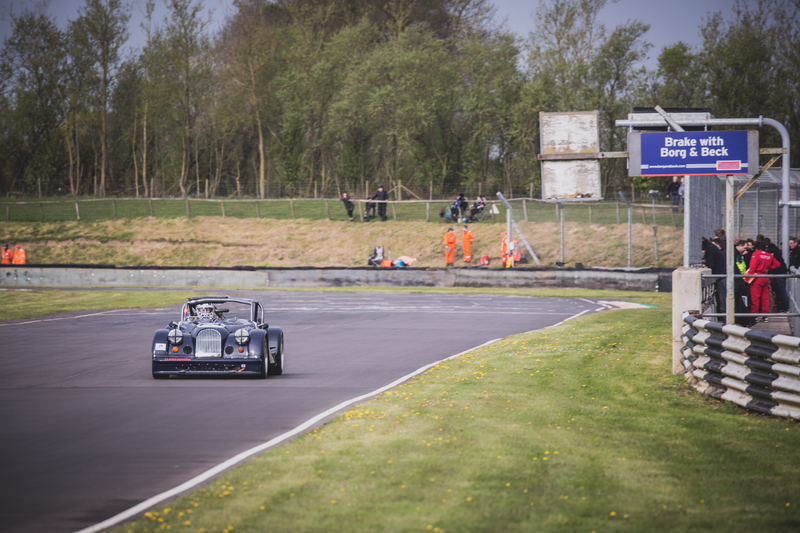 Further down the grid Craig Hamilton-Smith, on his first visit to the circuit, managed to finish in 17th position and was pleased to shave seconds off his lap time in qualifying. 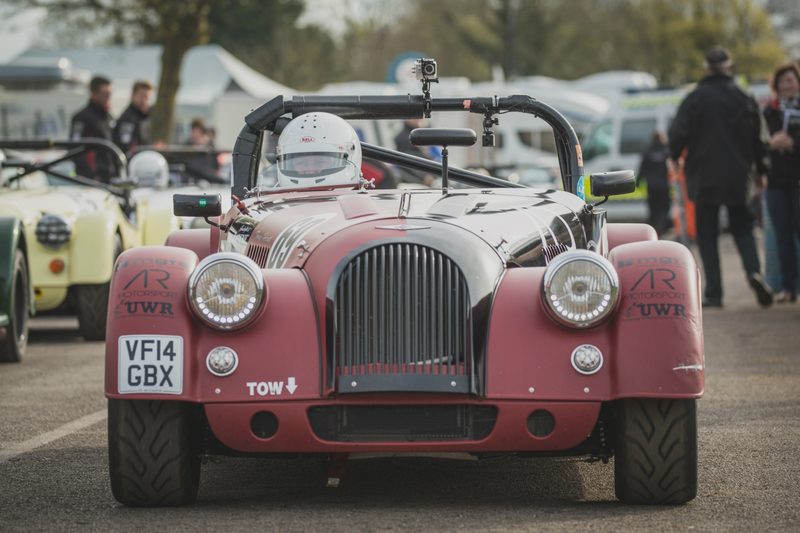 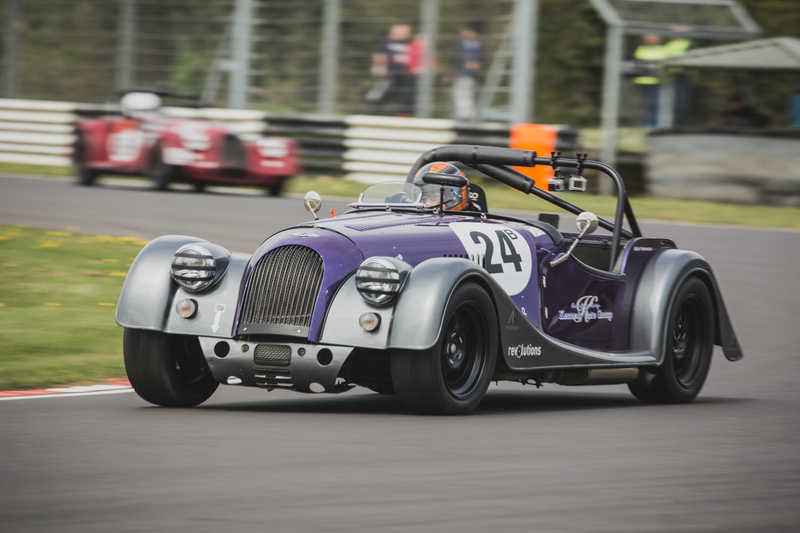 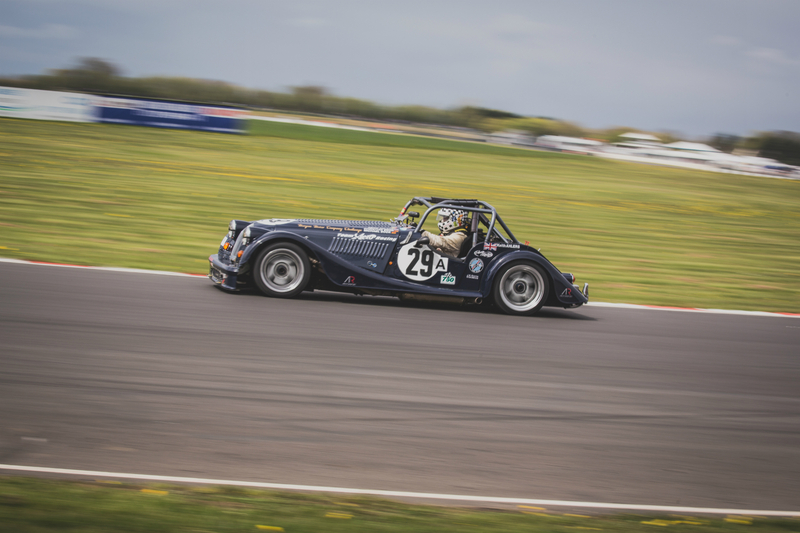 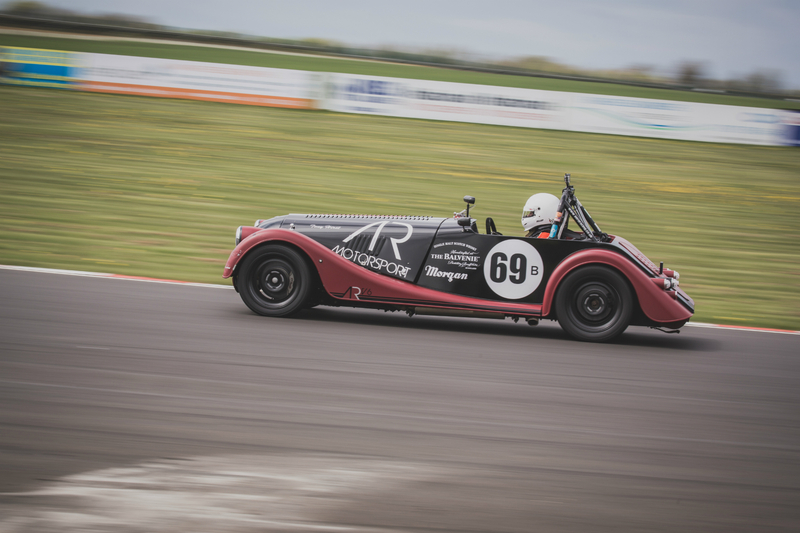 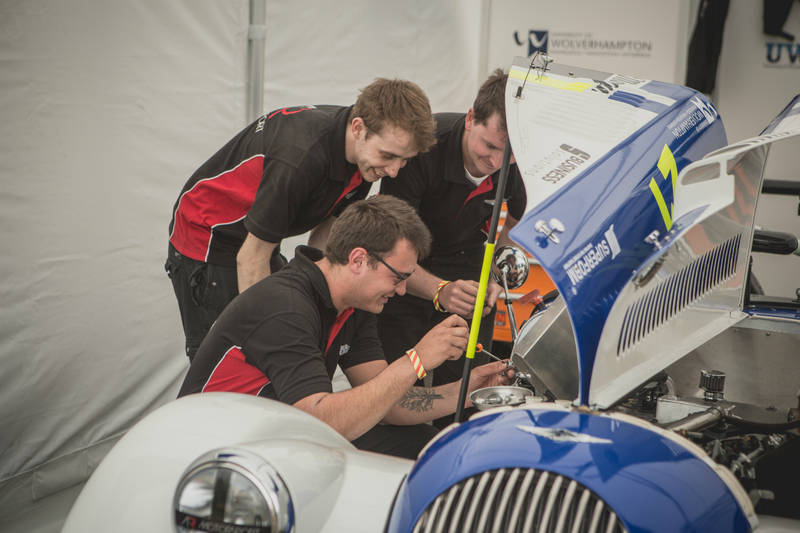 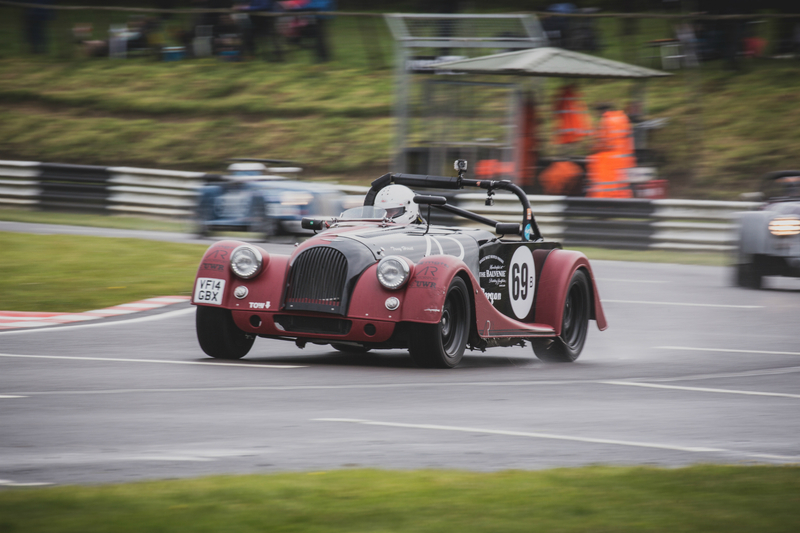 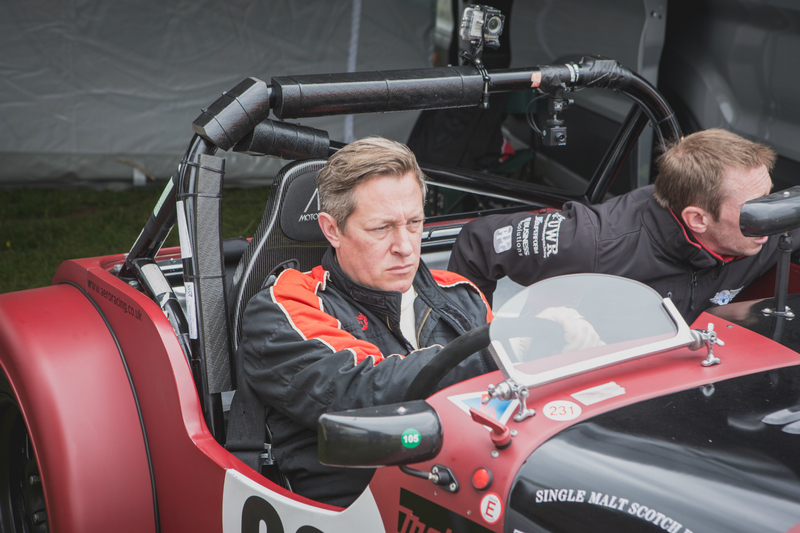 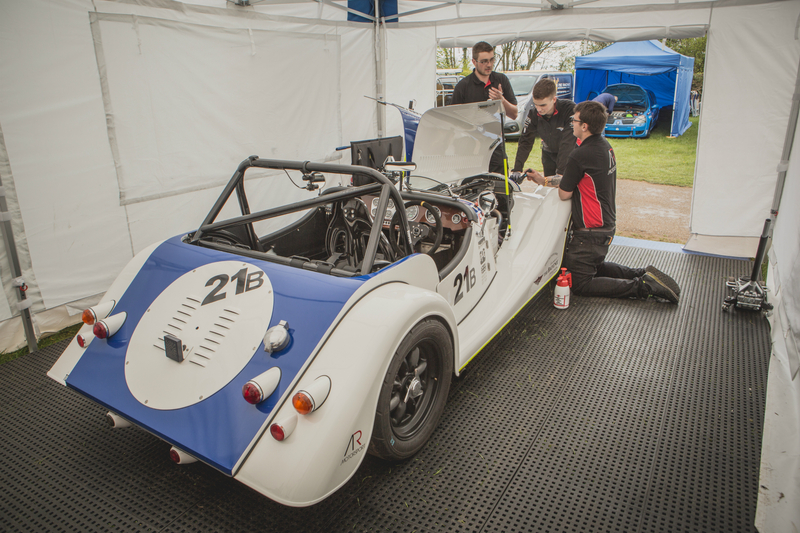 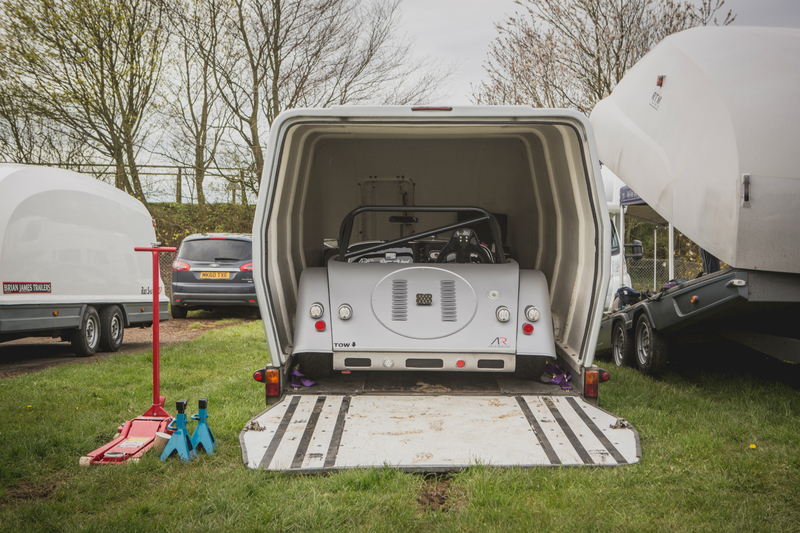 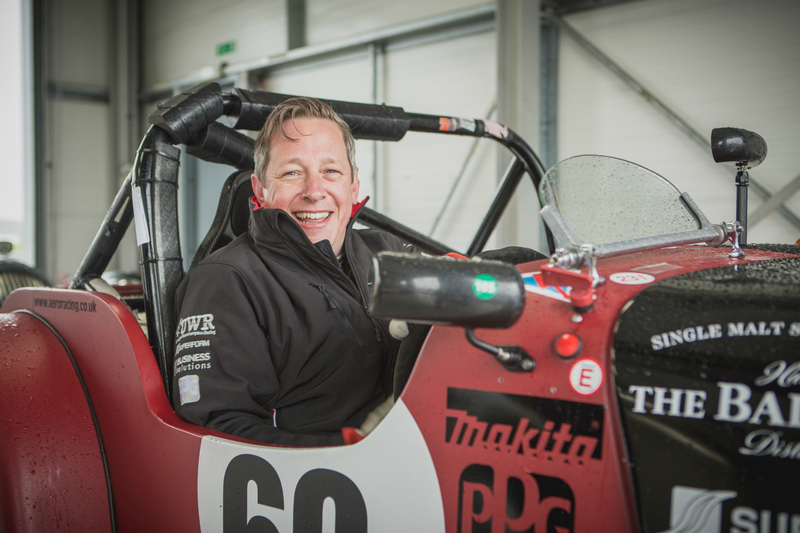 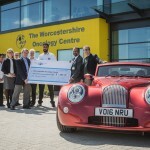 Driver of the race went to a well-deserved James Carter in one of his first Morgan Challenge races, finishing in 10th place under 1 second behind Simon Scott. 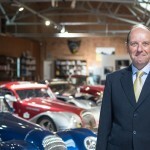 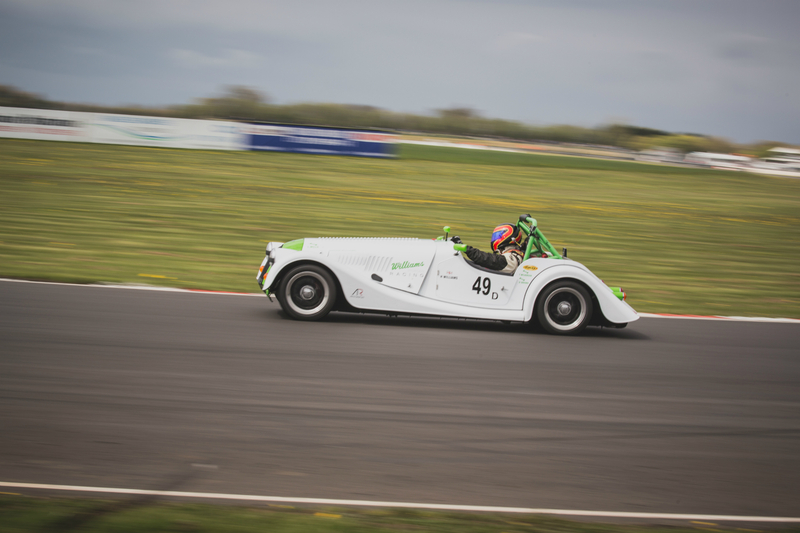 Well done James, a promising drive! 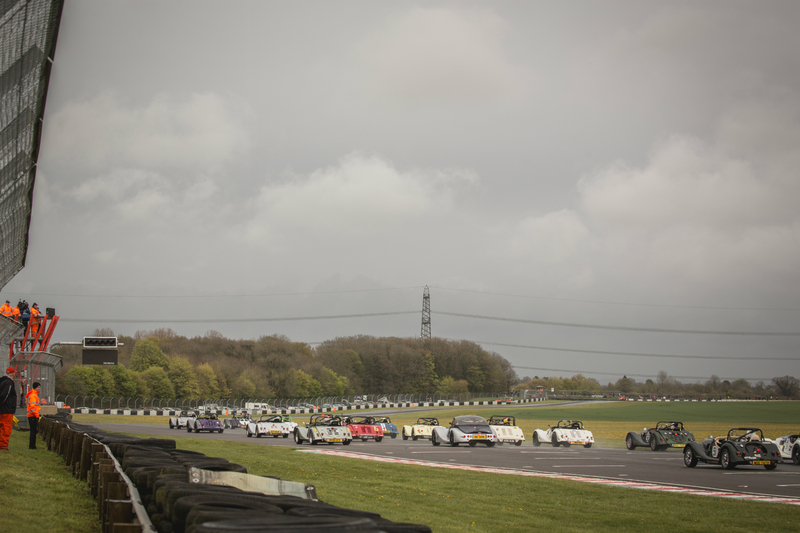 The heavens opened almost as soon as the chequered flag dropped for the first race and the cars had returned to the paddock. 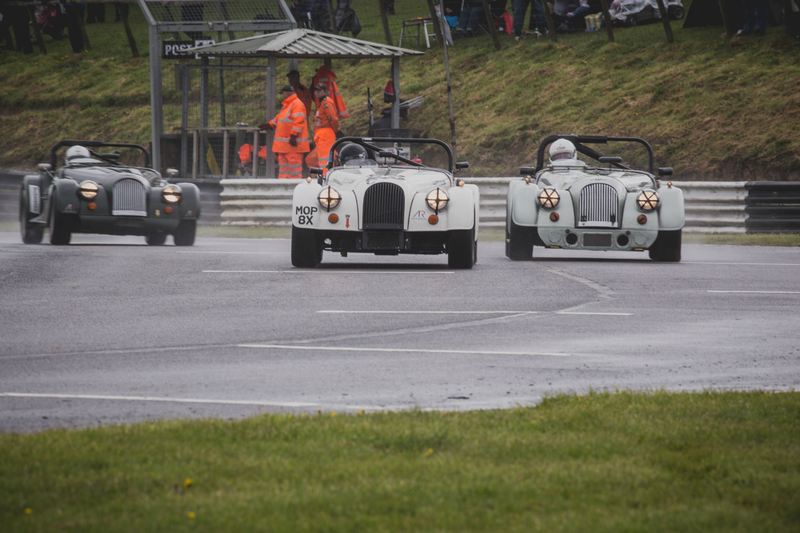 A few hours between the two races meant the track was suitably wet for the start of the live televised second race, even if the rain had stopped coming down. 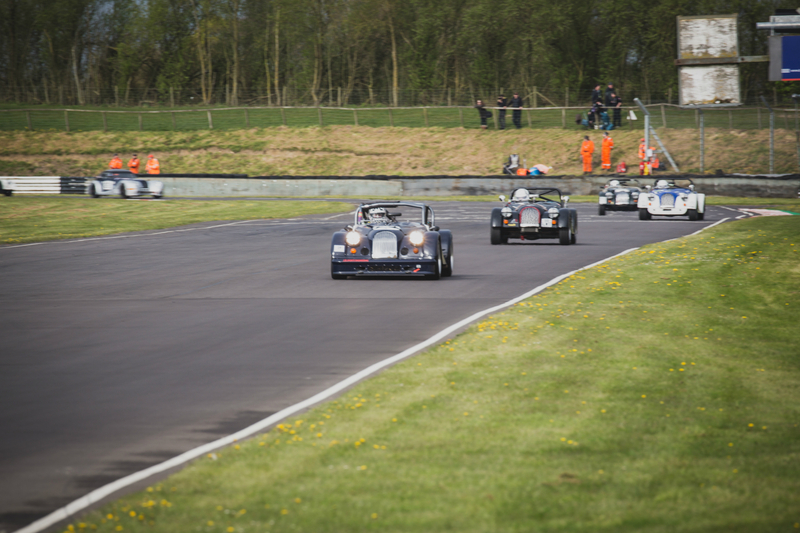 This race wasn’t for championship points but you wouldn’t have guessed it with some hard racing from all concerned. 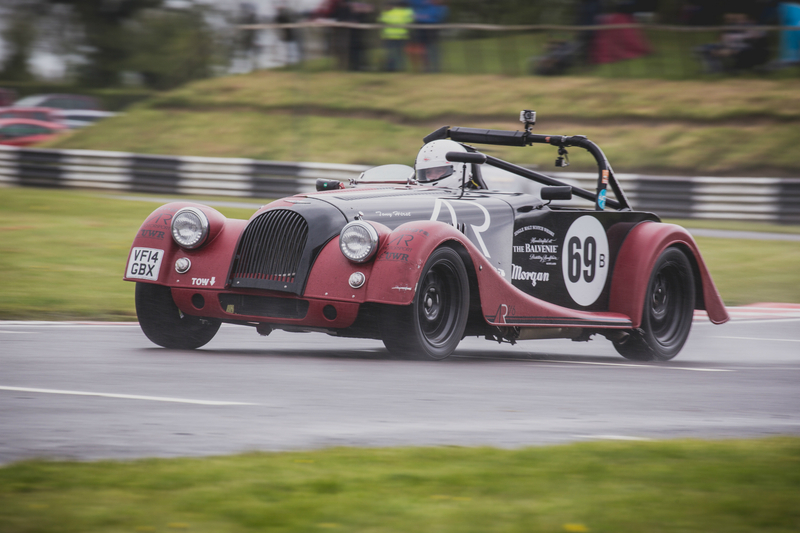 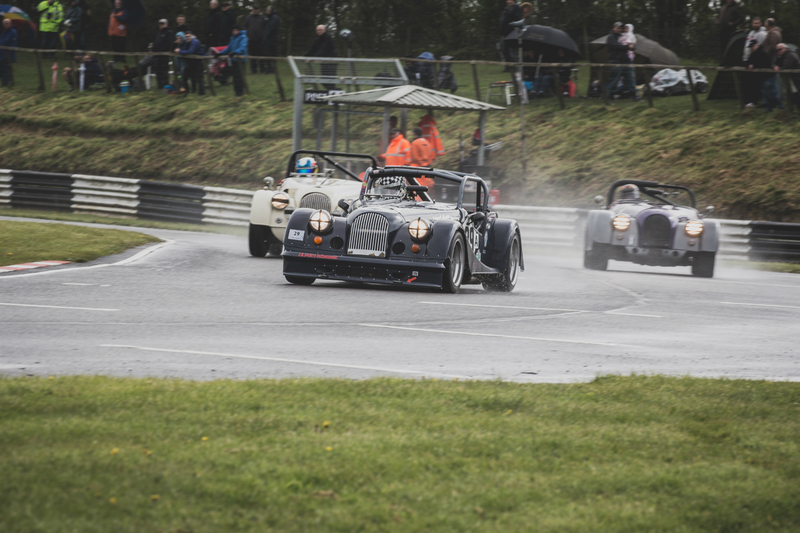 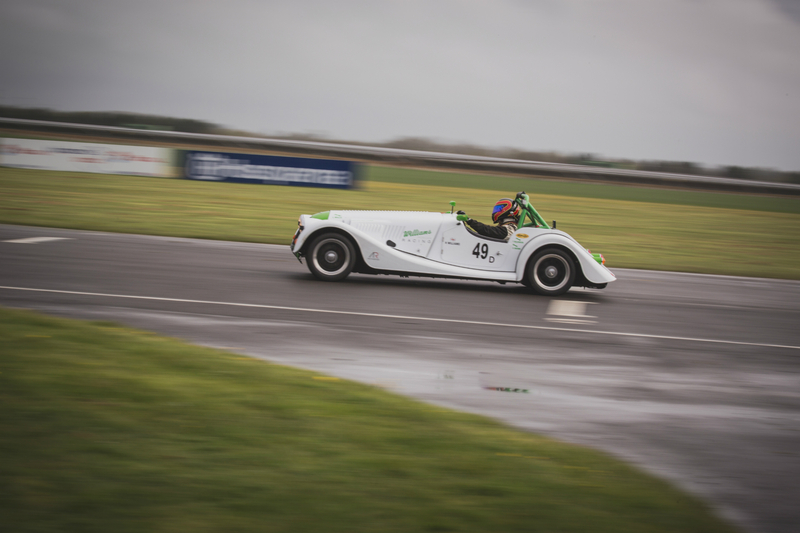 As the lights went, Keith Ahlers shot away, closely followed by Elliot Paterson and Andrew Bentley, both of which had mastered the wet conditions at Snetterton a month before. 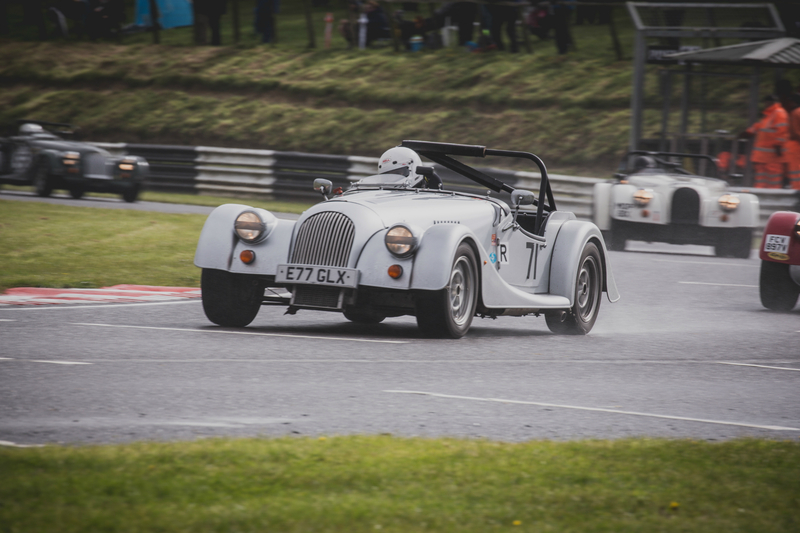 With the skinnier tyres of Bentley’s 4/4 proving more manageable in the wet, he drove a superb race to stick with Ahlers all the way to the finish, unfortunately losing a little bit of speed on the V8 as the track began to dry out. 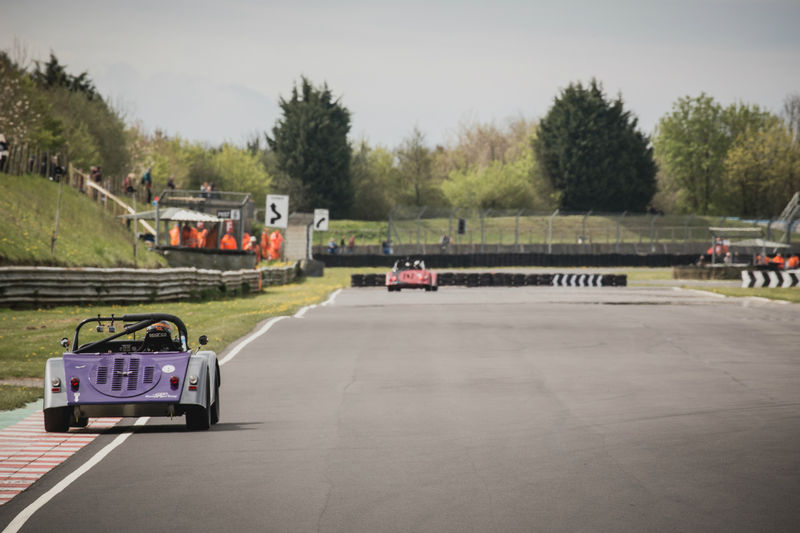 Still, there was just a second between them at the chequered flag. 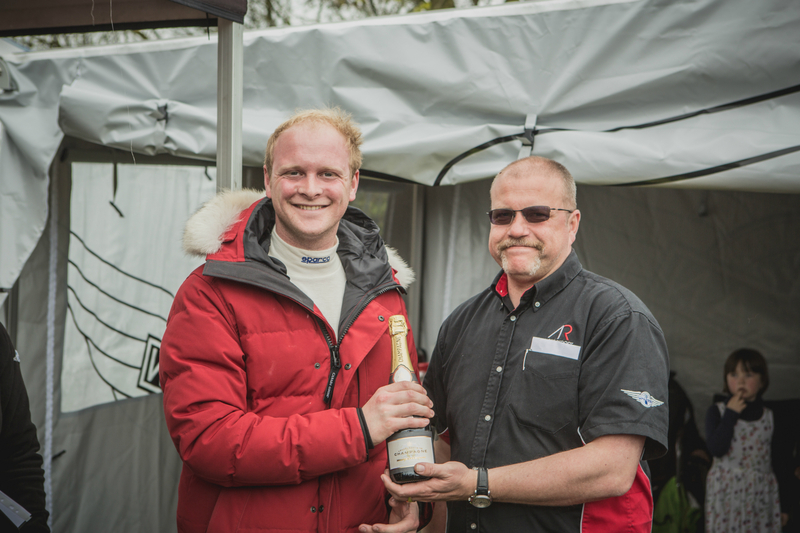 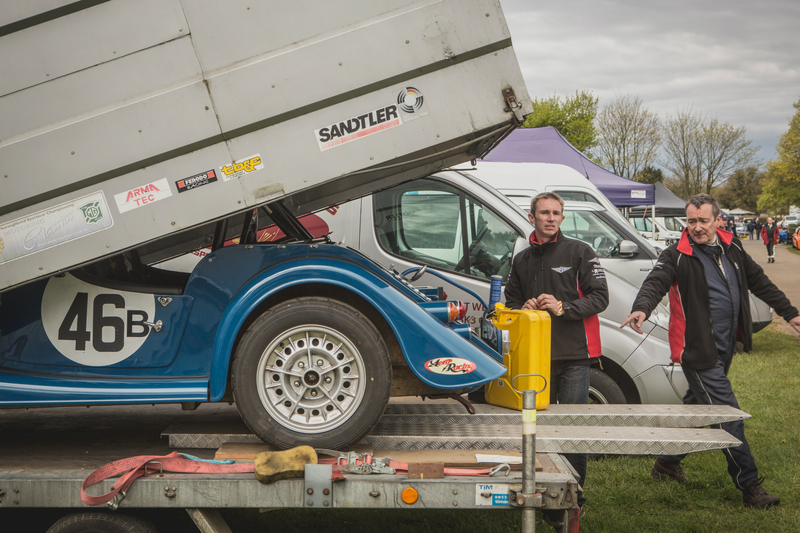 Elliot Paterson finished 3rd overall and 1st in class B, with Tony Hirst in 2nd after Andrew Thompson retired. 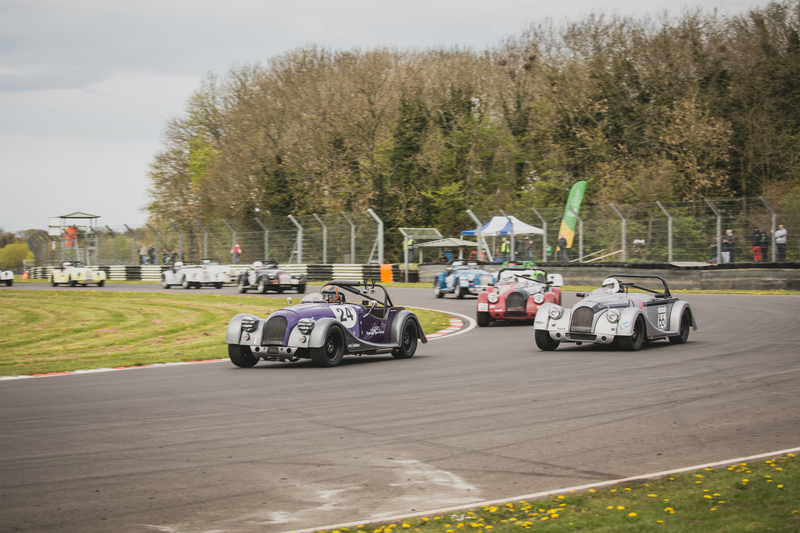 Tim Parsons, Phill Thomas, Kelvin Laidlaw and Tim Ayres all exchanged positions and only 2 seconds separated them all at the end. 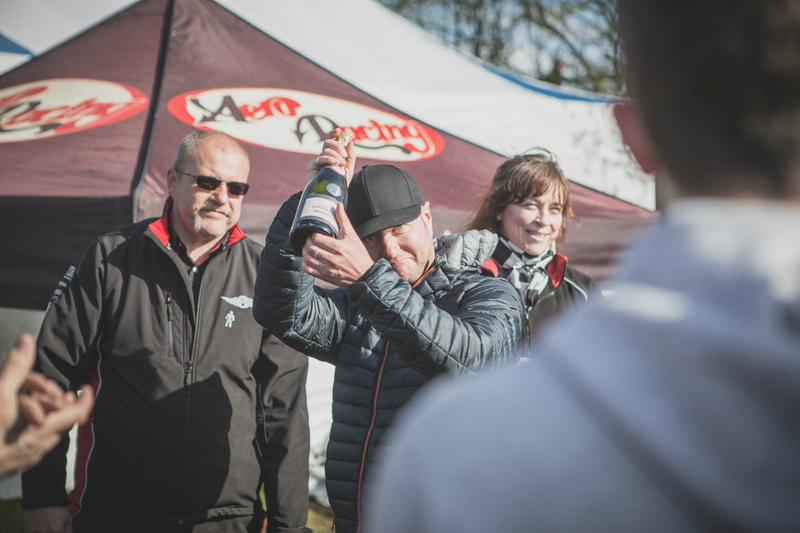 Tim Parsons and Tim Ayres winning their respective classes for the second time that day. 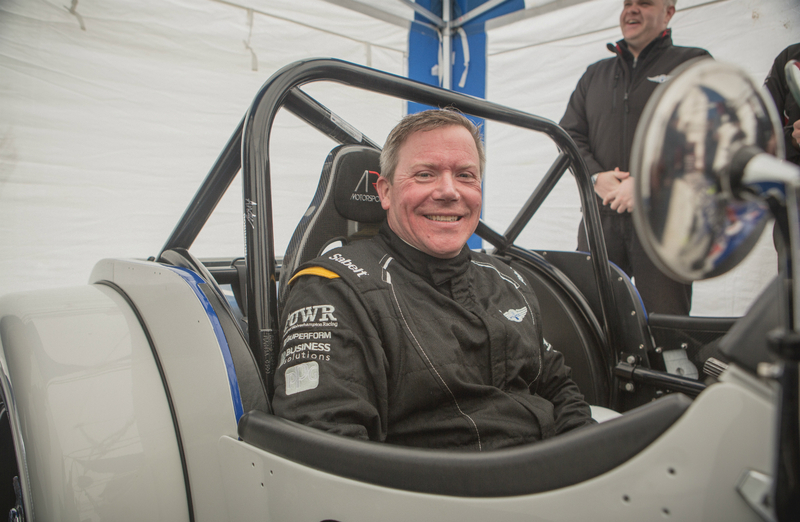 Driver of the day for race 2, undoubtedly, was Andrew Bentley, who won Class D, set the overall fastest lap of the race and finished right behind Keith Ahlers. 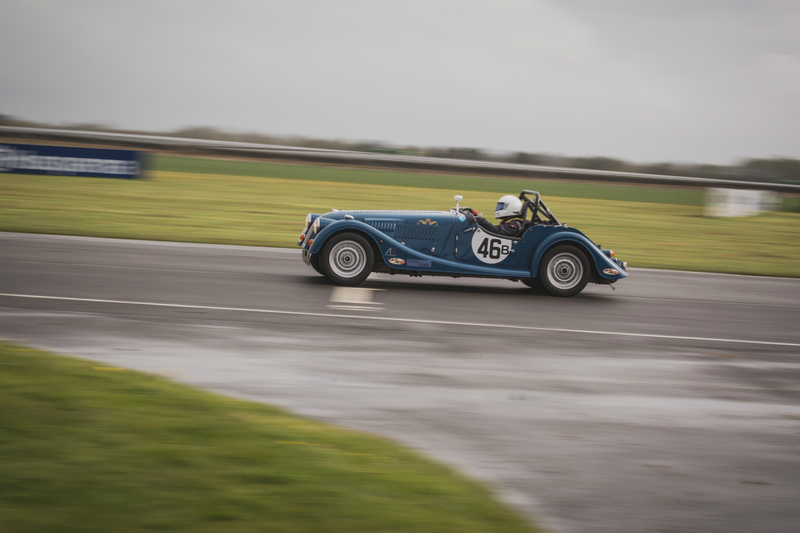 A superb drive in challenging conditions and a well-deserved accolade for Bentley to finish off the day. 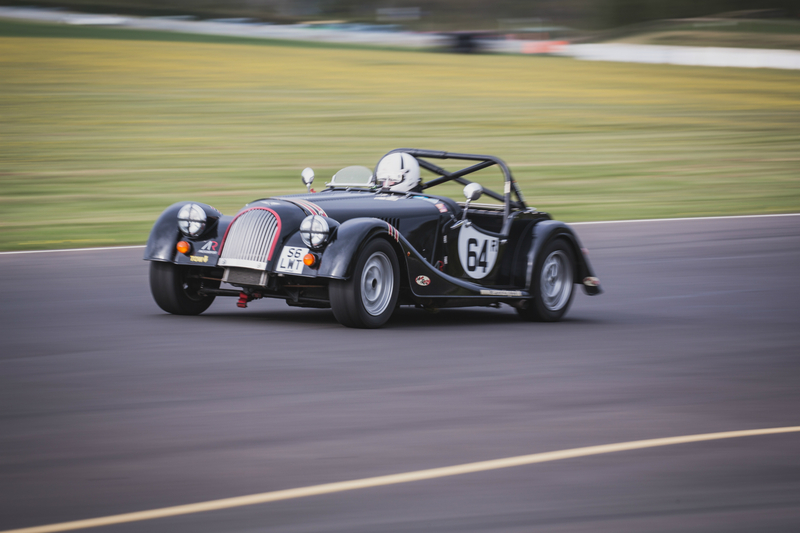 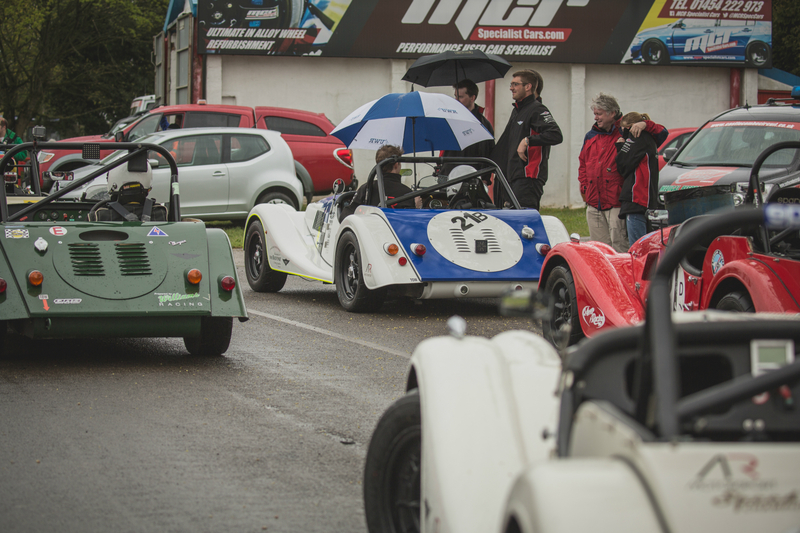 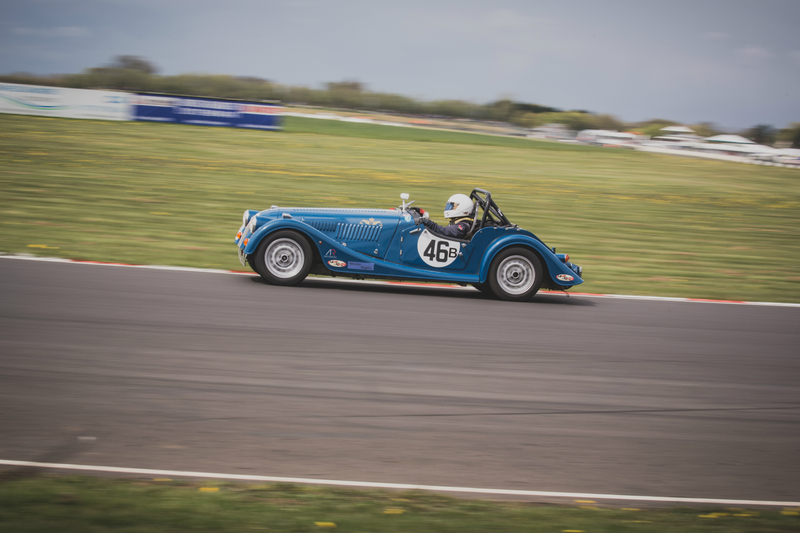 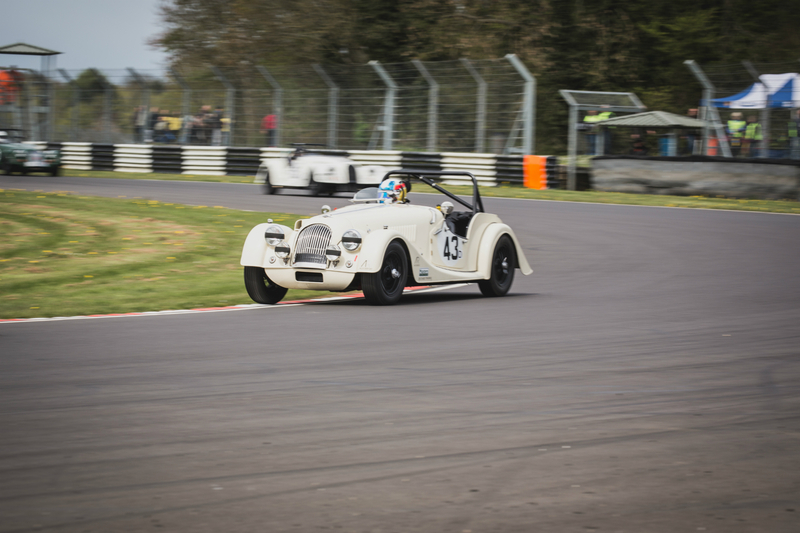 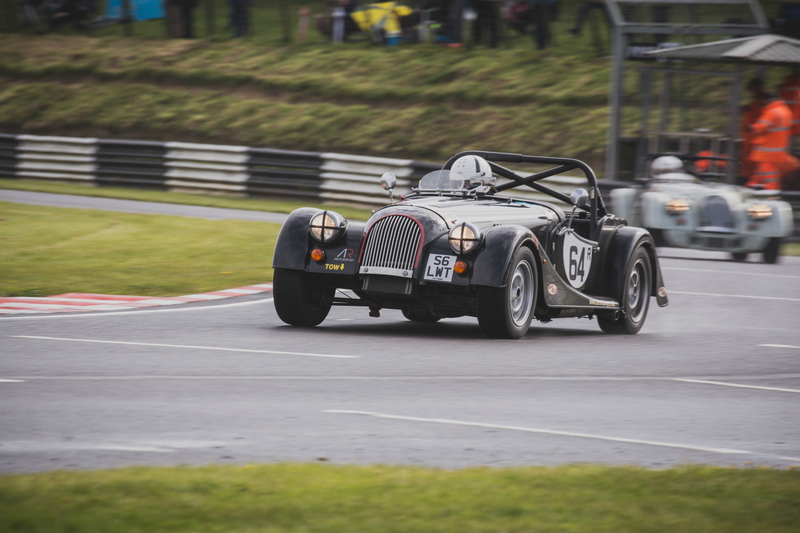 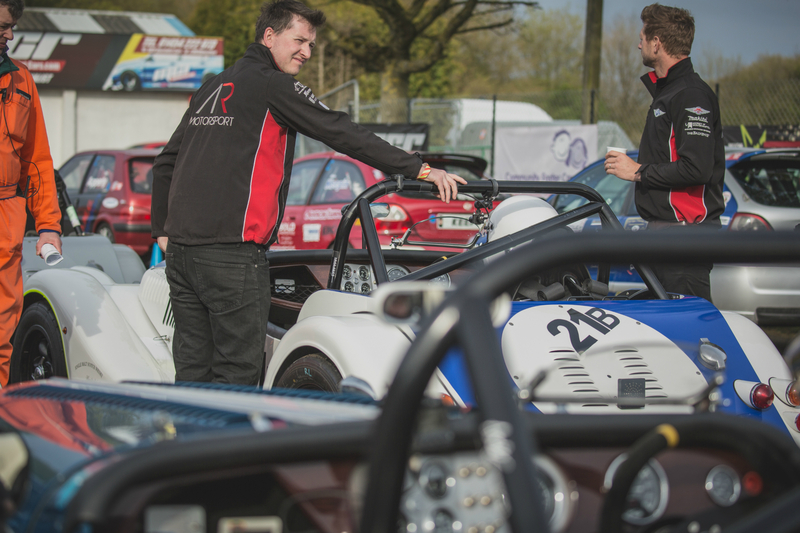 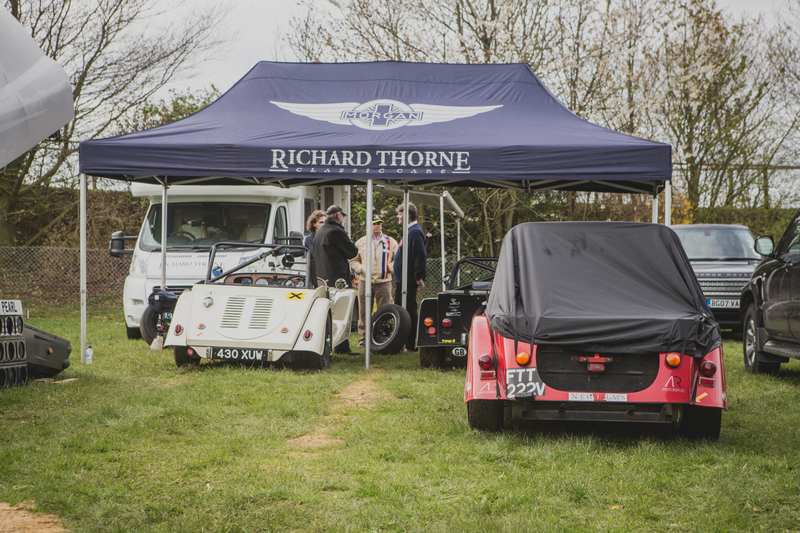 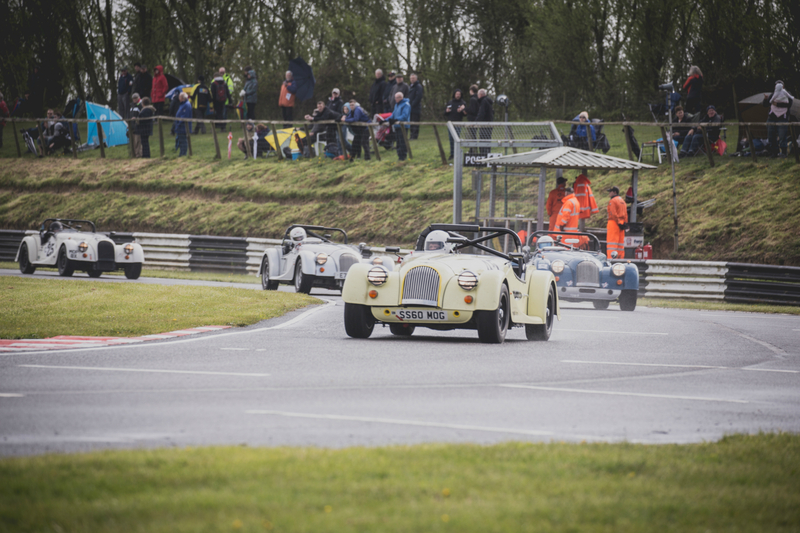 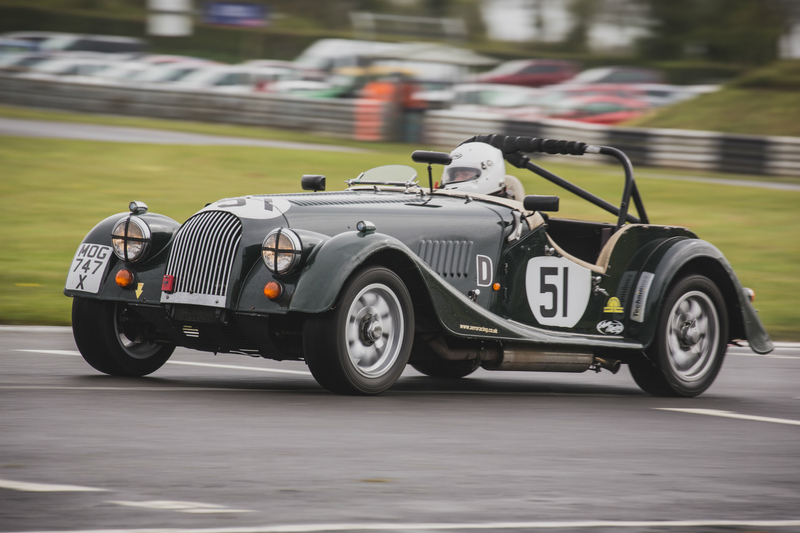 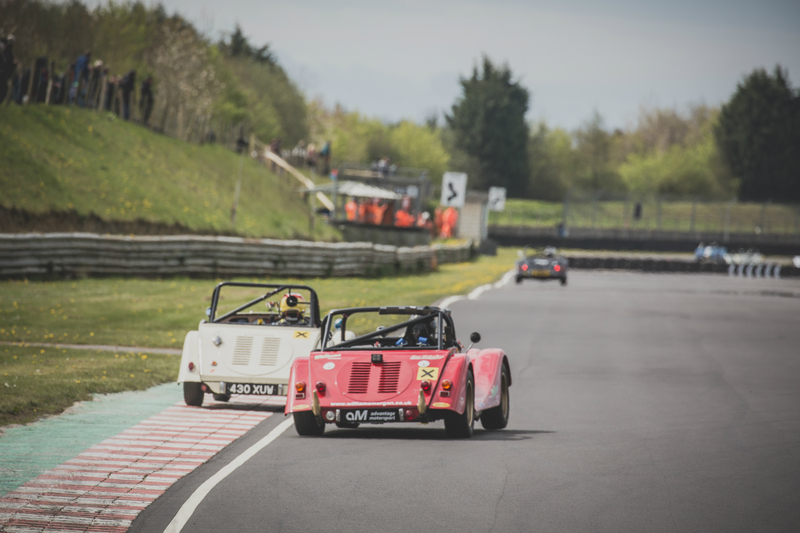 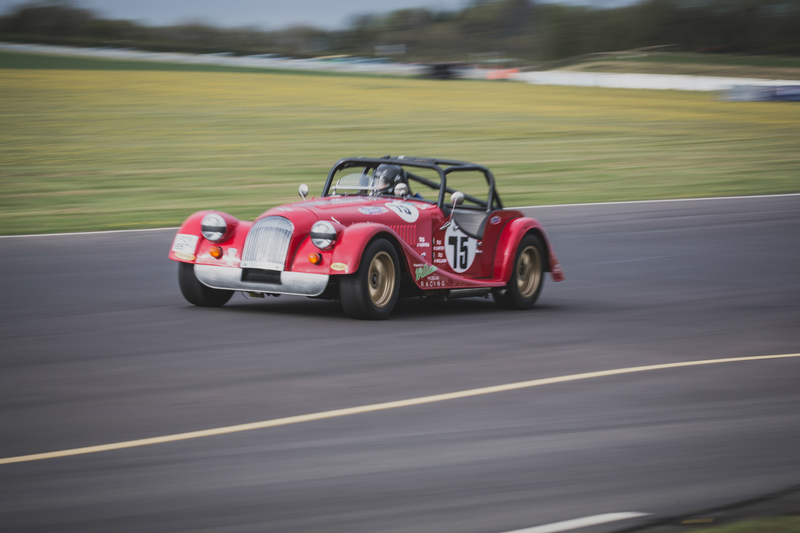 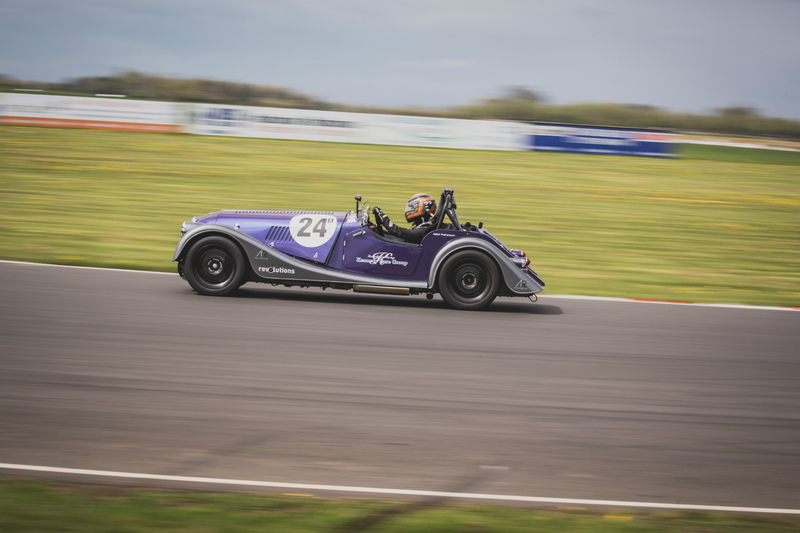 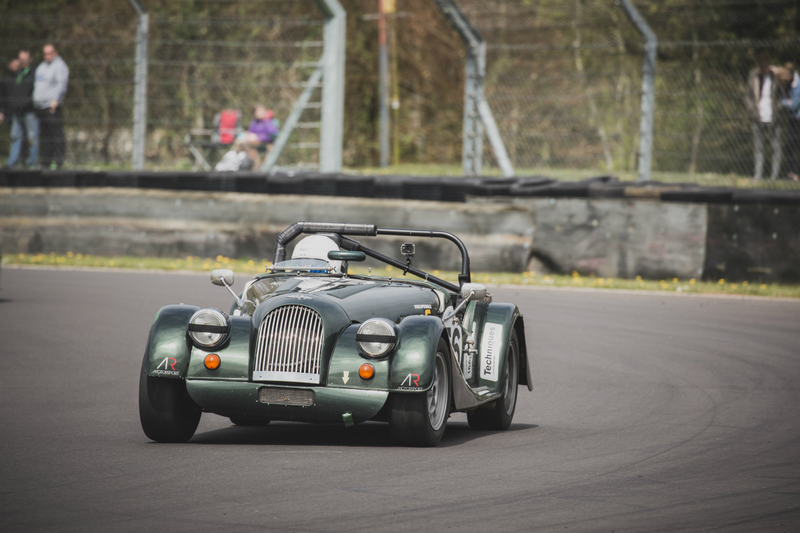 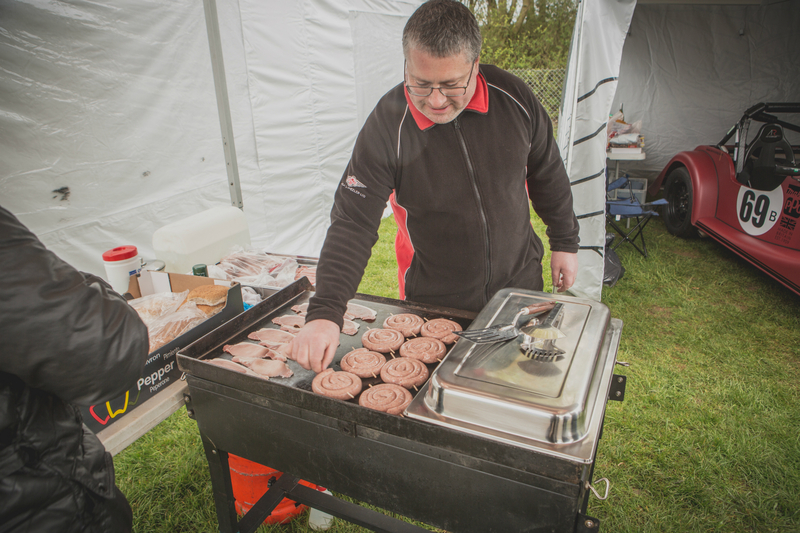 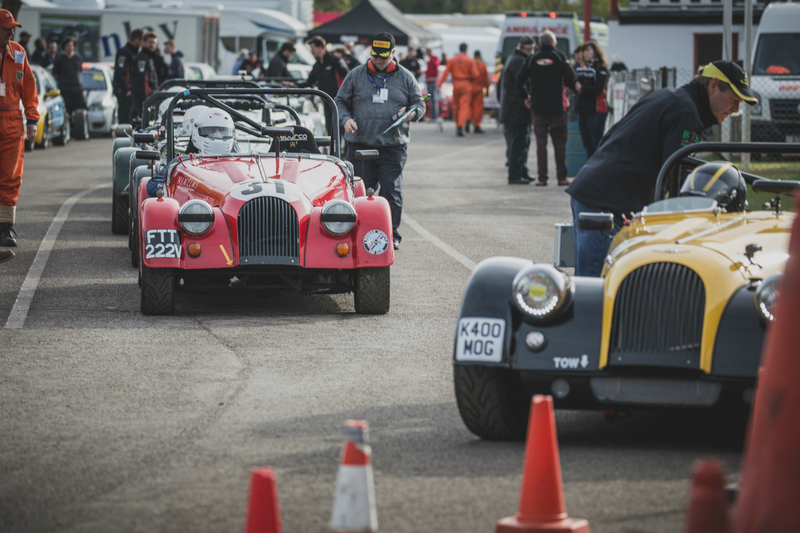 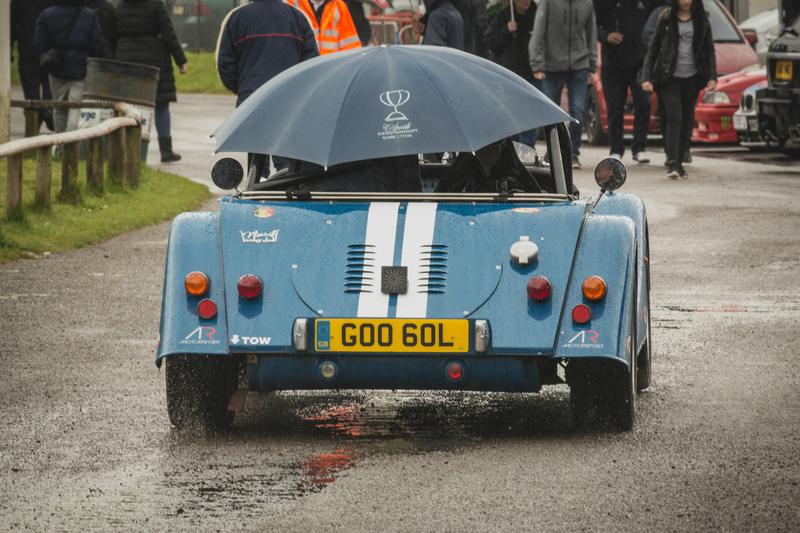 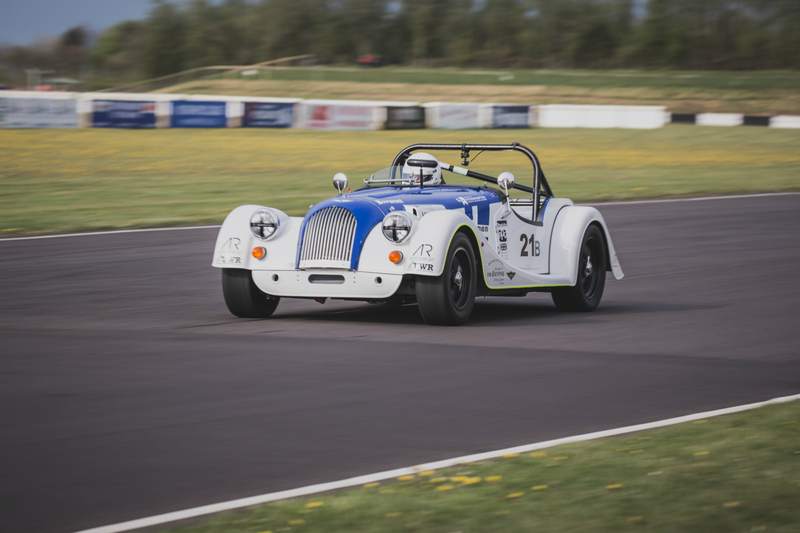 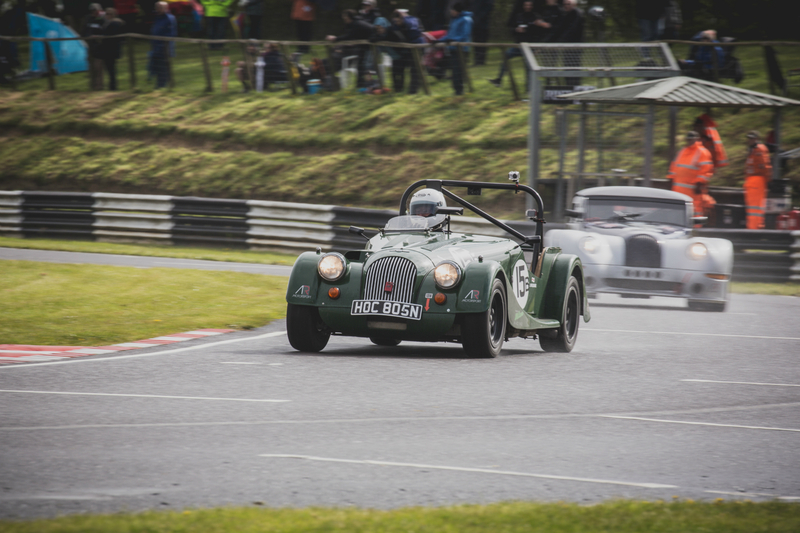 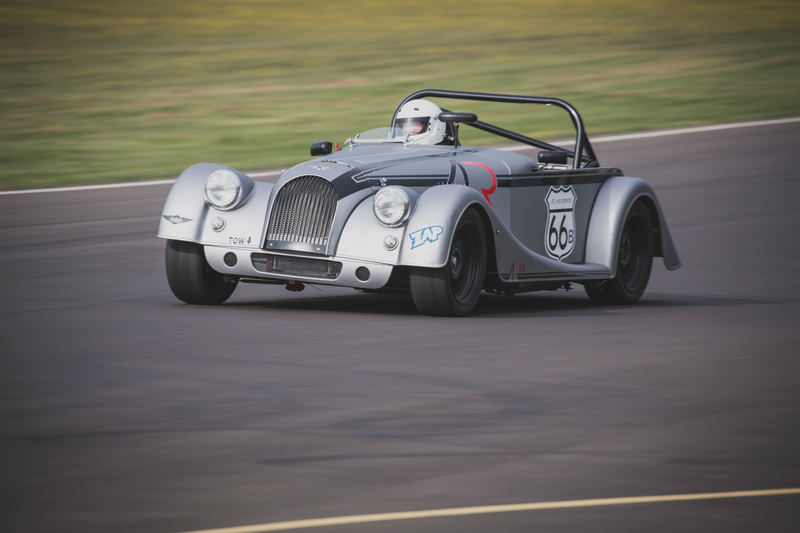 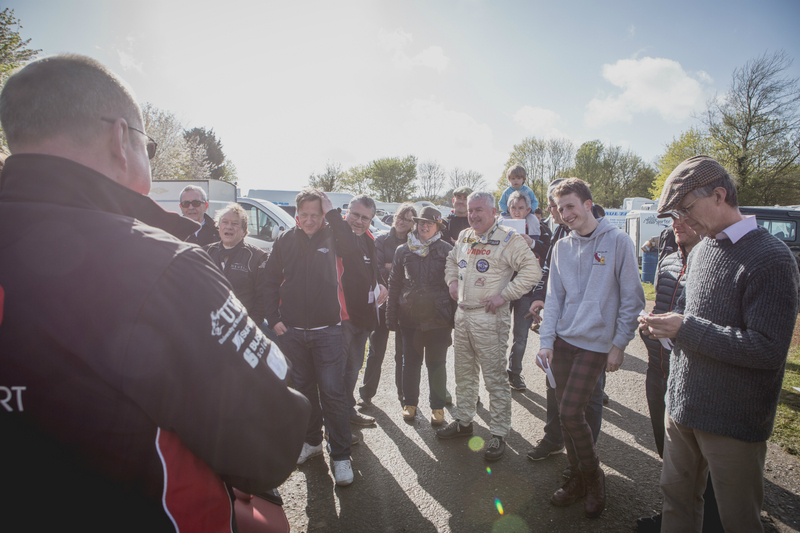 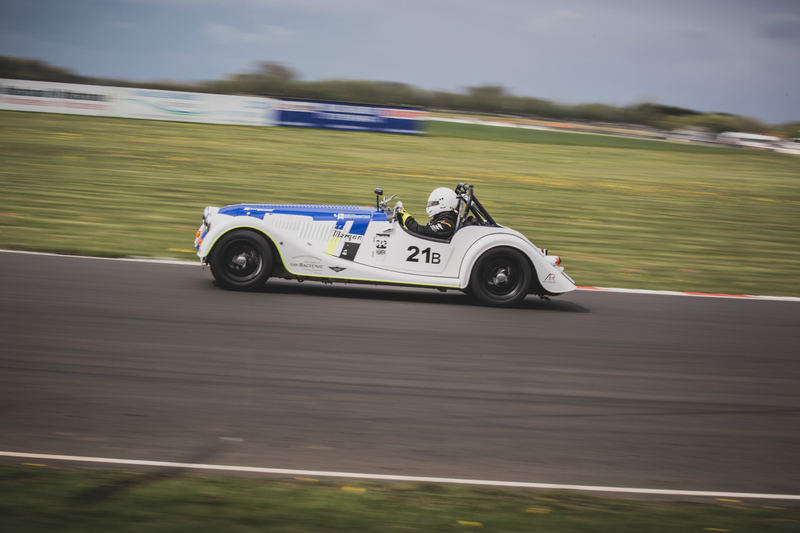 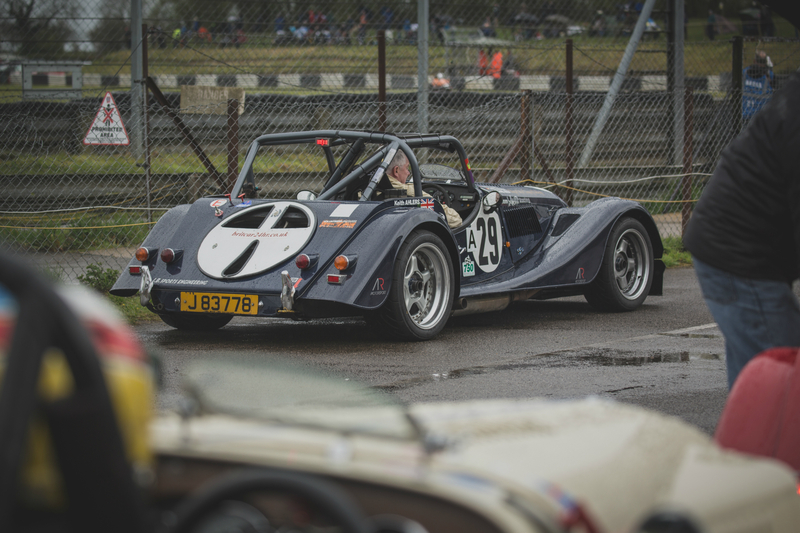 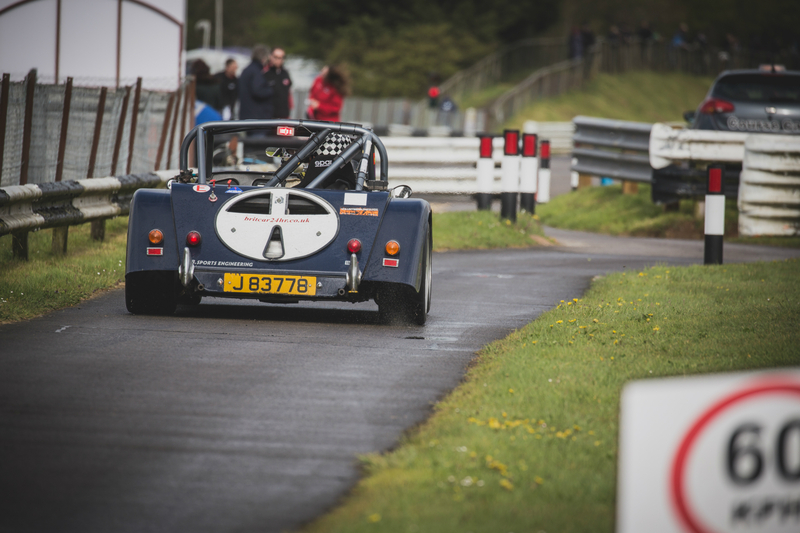 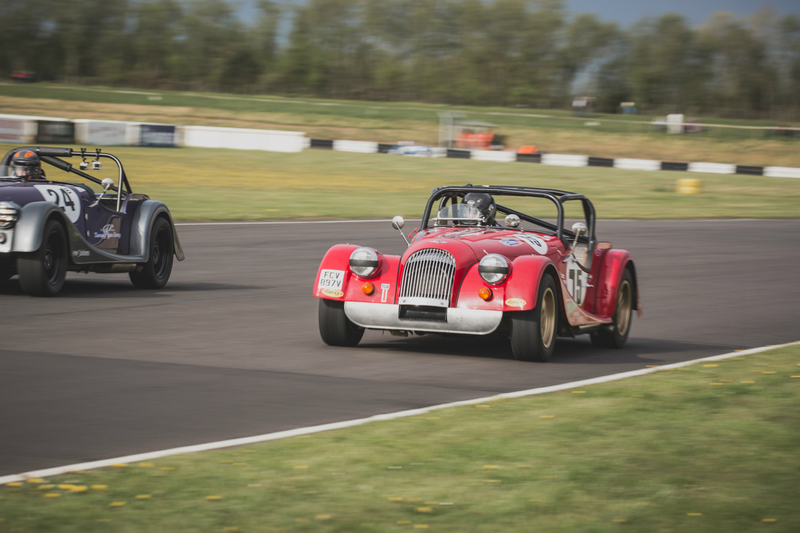 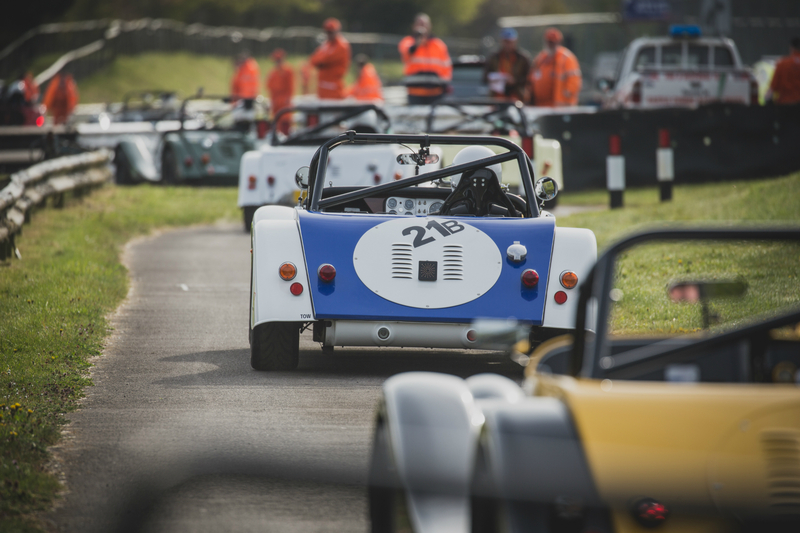 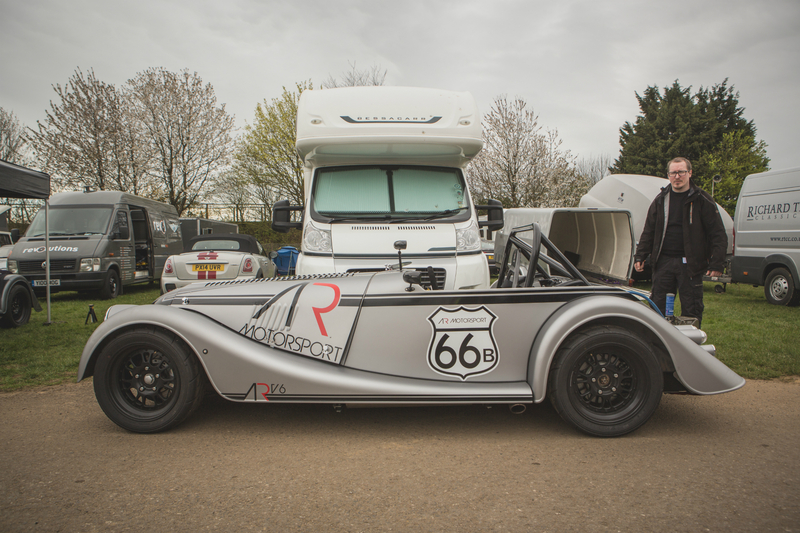 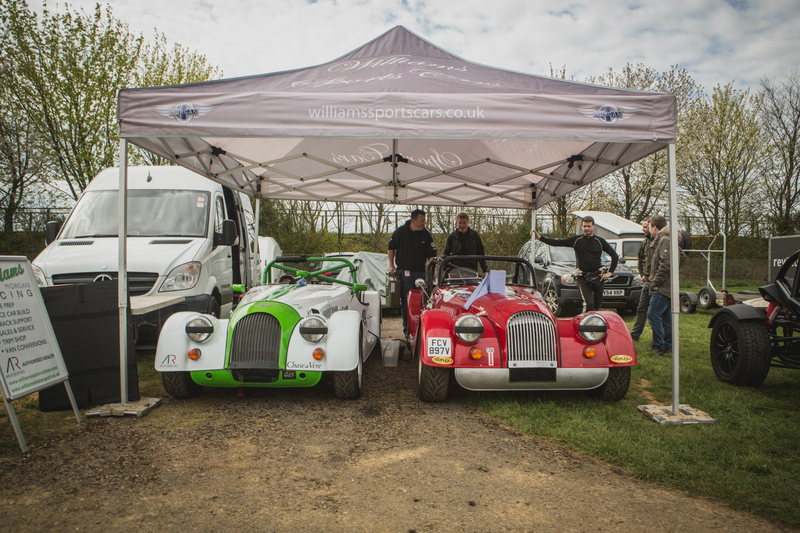 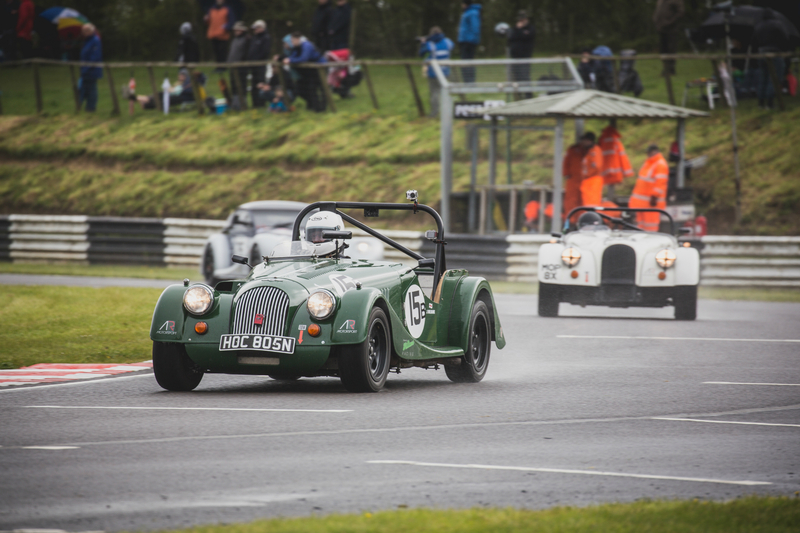 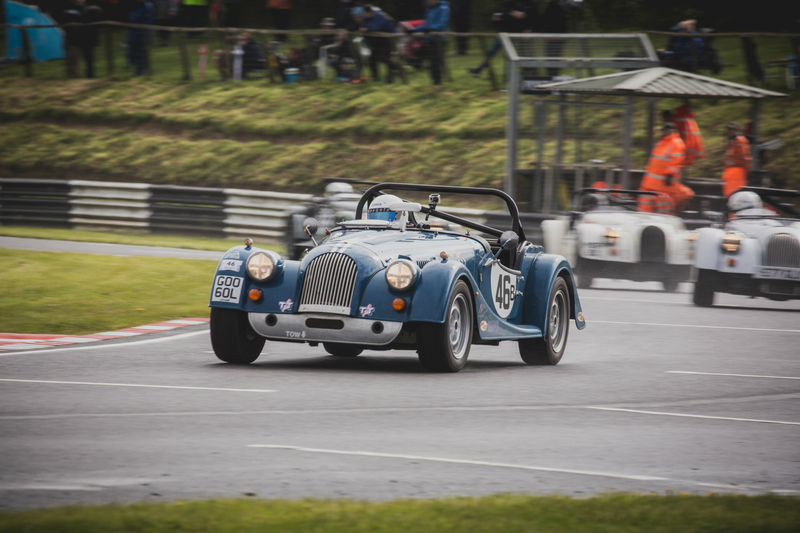 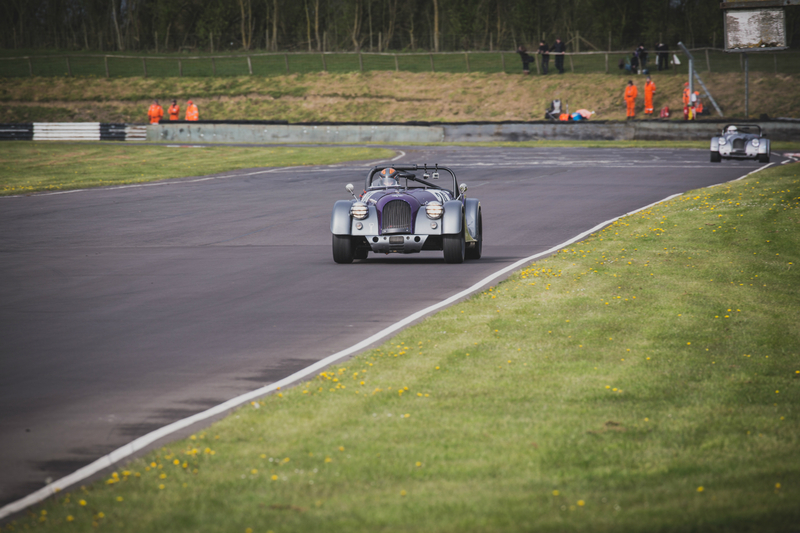 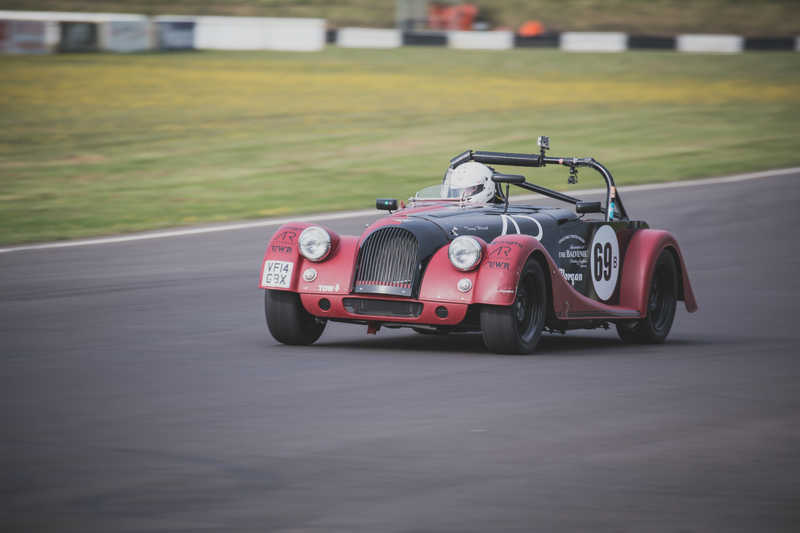 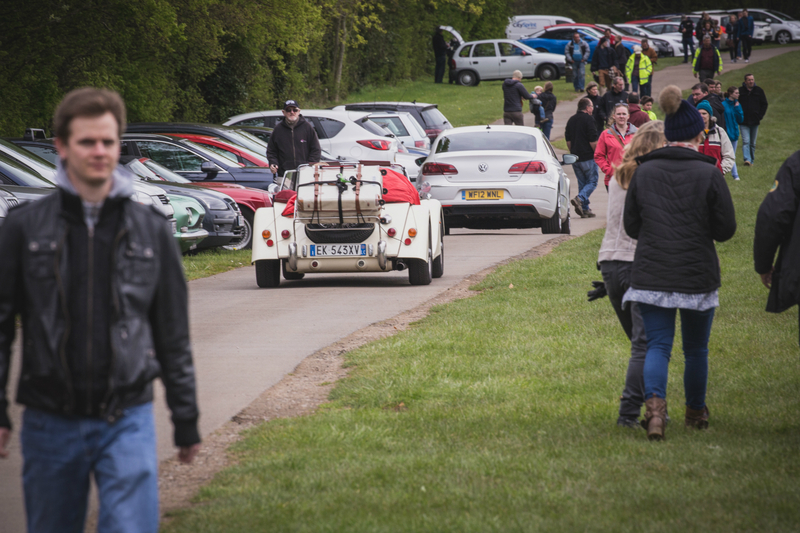 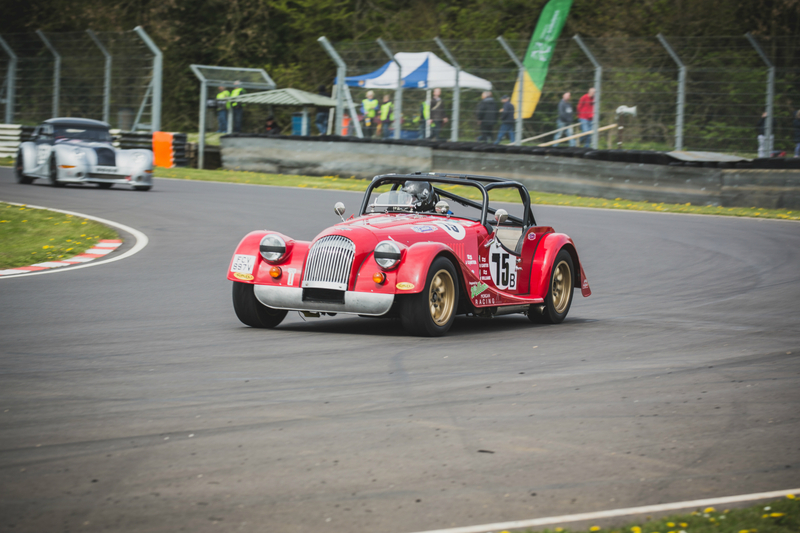 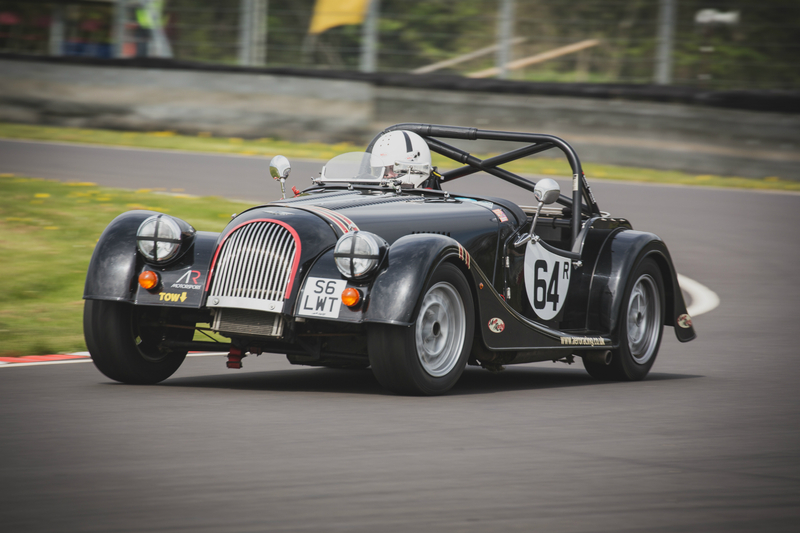 Your first time racing at Castle Combe, how did you find it? 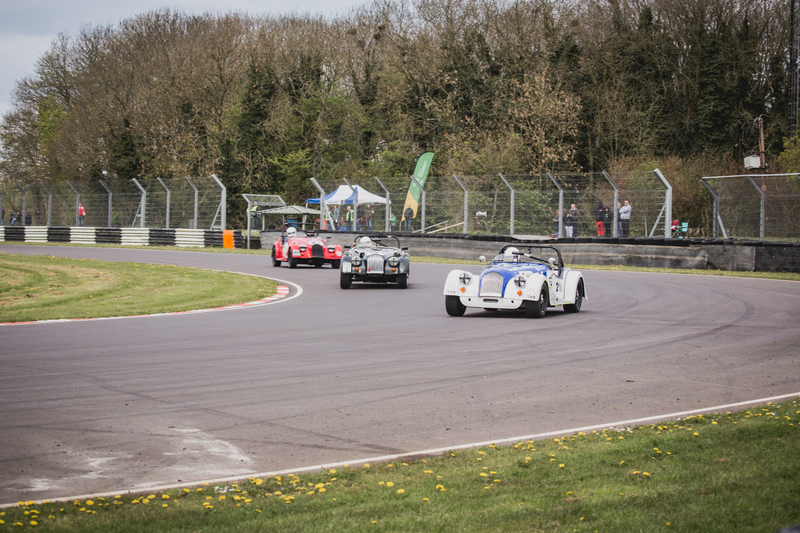 I’d been told just how challenging Castle Combe is as a circuit. 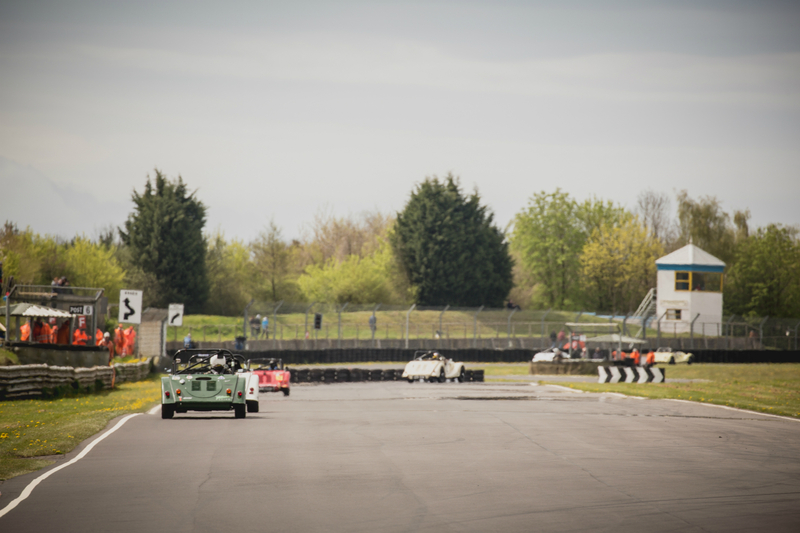 It looks flat but has some very fast corners and some tricky chicanes, what isn’t so visible from the side of the track is the bumps. 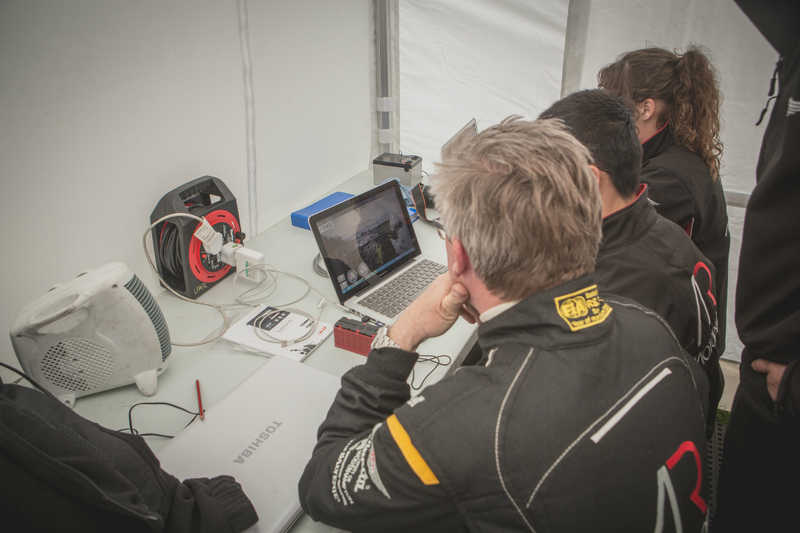 This became very evident during our track walk the day before. 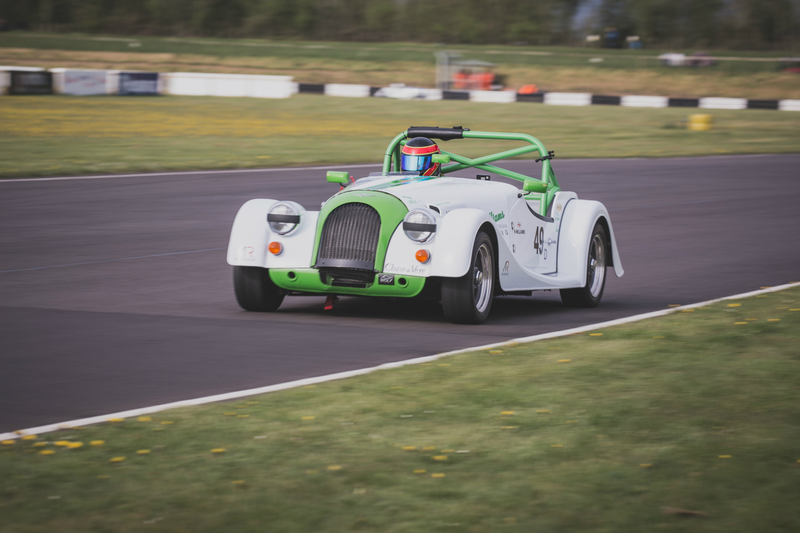 As we hadn’t had any practise sessions or simulator sessions, qualifying was my first time properly learning the circuit. 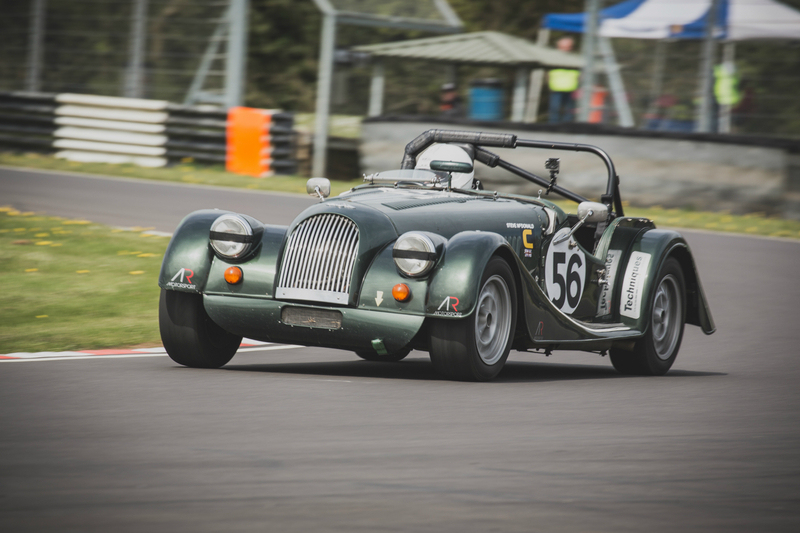 Qualifying went well, and was the first time we’ve had a camera fitted to the car, this allowed us to watch the footage from the first session immediately. 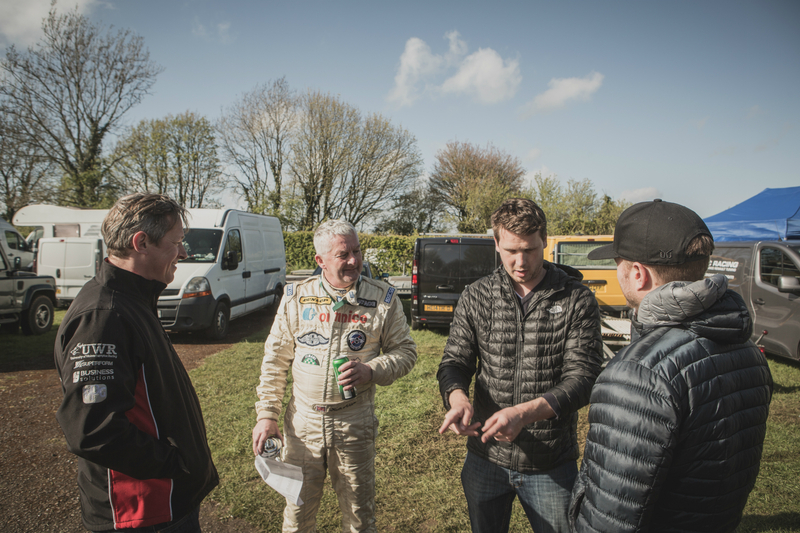 Shane talked me through my laps, identifying areas where I could alter my gear changes and racing line. 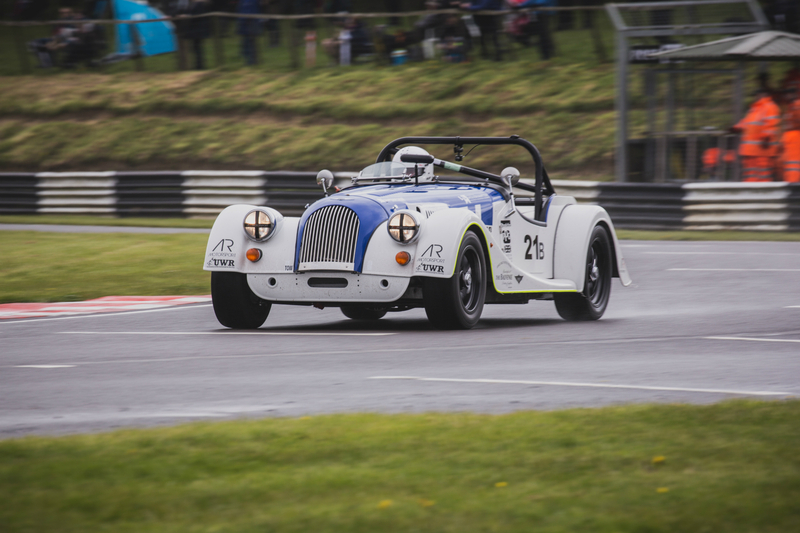 Track conditions remained dry for the first race and I was pleased to take almost 4 seconds off my time between qualifying and the race. 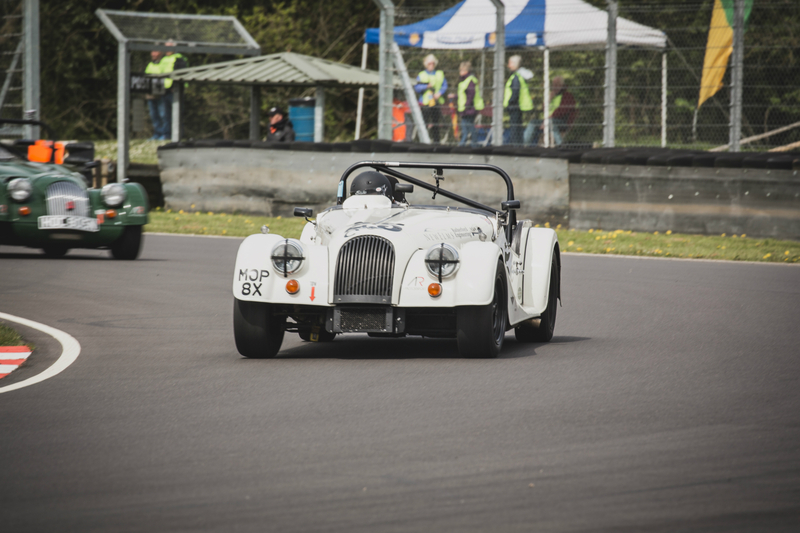 As there was only a 20 car grid I didn’t have too many other cars around me but a few more laps and I think I’d have caught the car infront. 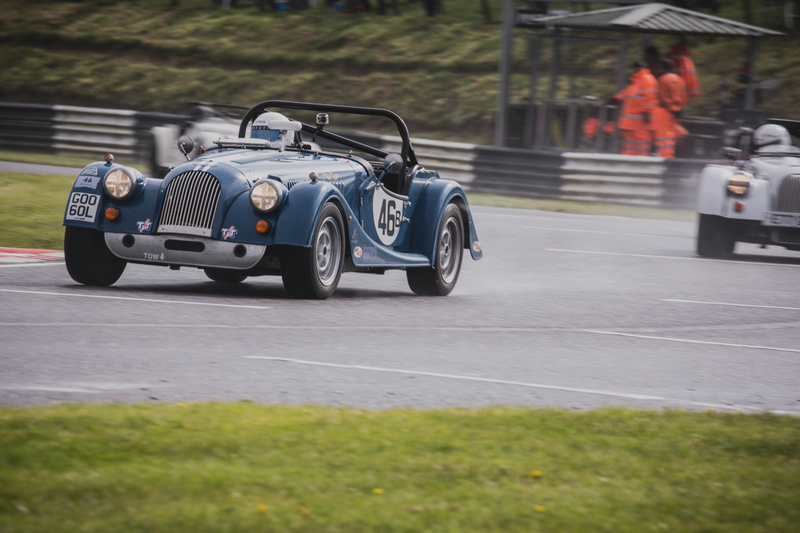 Unfortunately conditions changed for the second race and the track was very wet and difficult to drive on, so it was just a case of hanging on and bringing the car home. 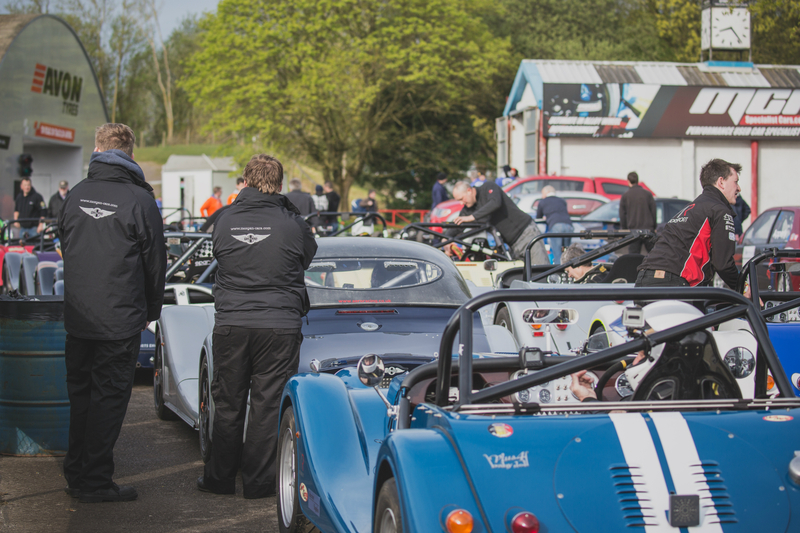 All in all another fantastic race meeting, I feel like the penny has dropped and I’m really looking forward to Donington for the Peter Morgan Memorial Race. 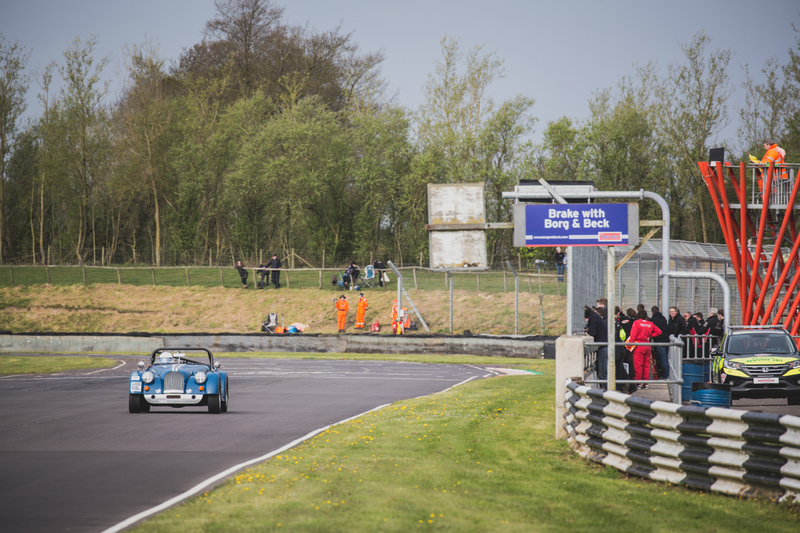 Where does Castle Combe rank in your list of favourite circuits? 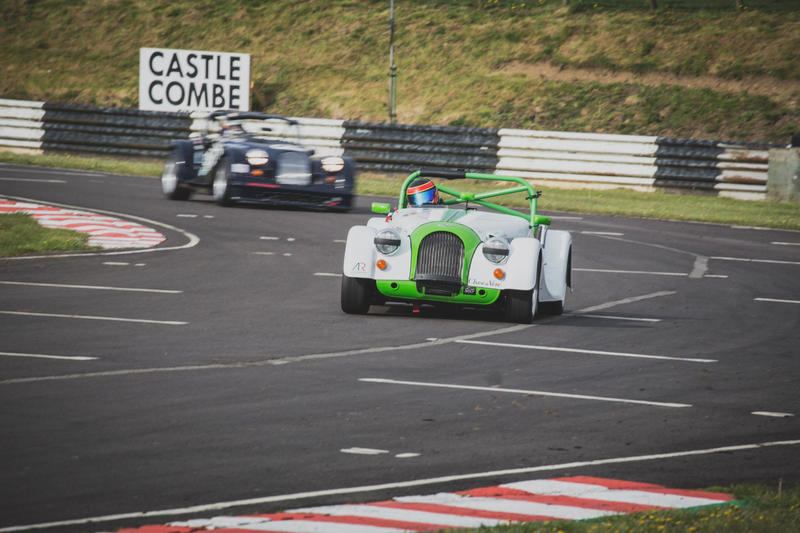 I love Castle Combe, it’s a good, old, proper circuit with a flat out oval. 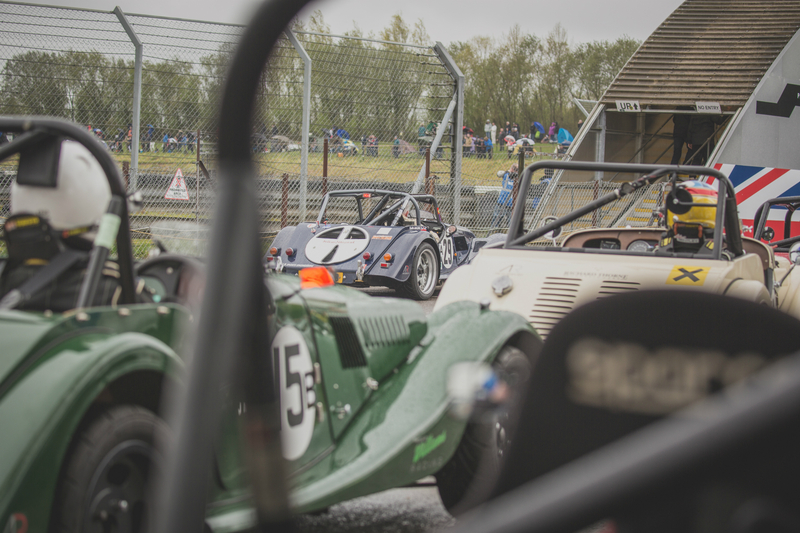 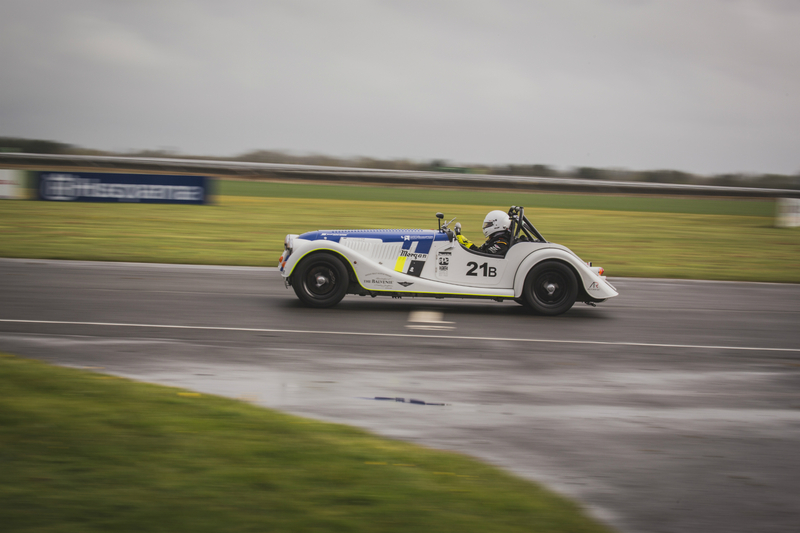 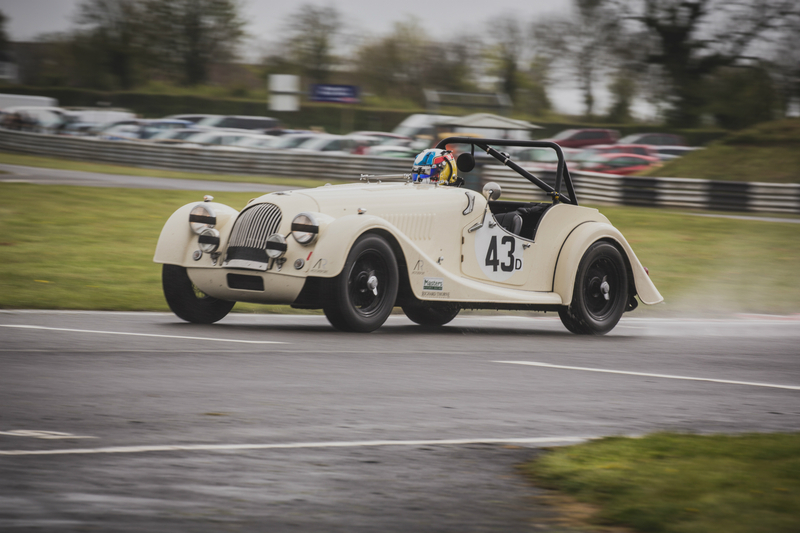 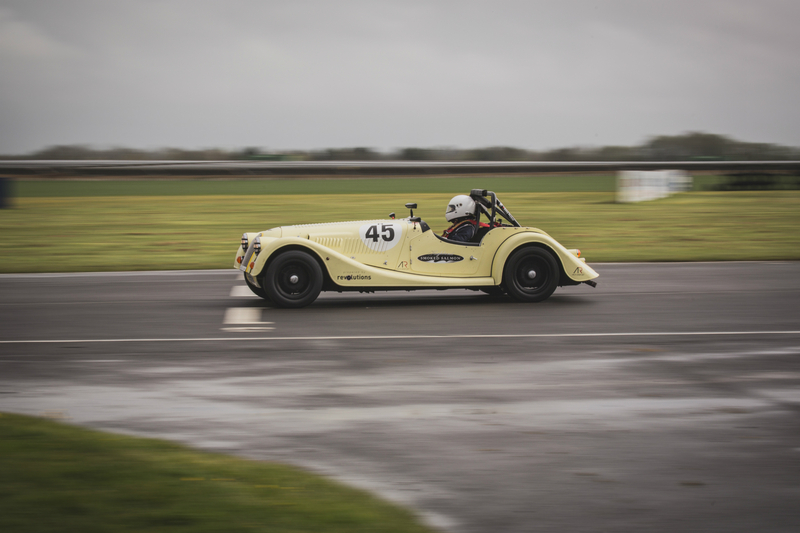 It’s incredibly bumpy with a couple of off camber chicanes and corners thrown in for good measure, it’s a proper seat of your pants, demanding circuit that’s completely unforgiving in the wet. 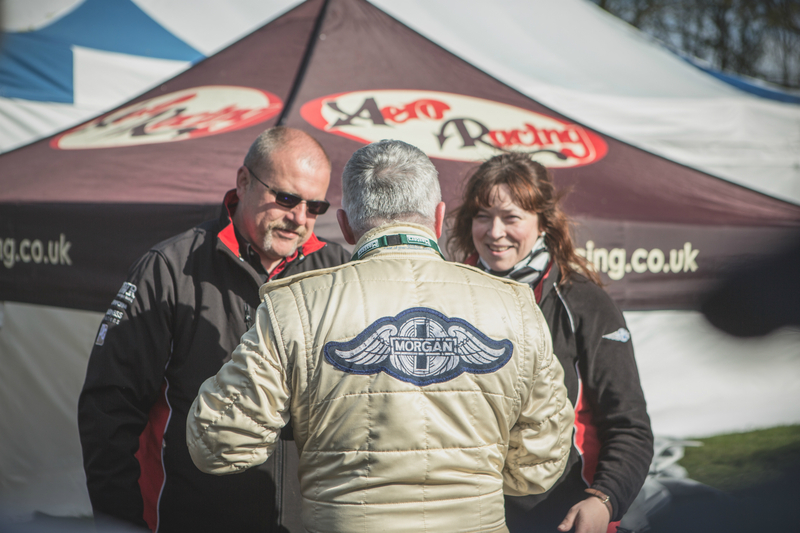 How do you feel the races went? 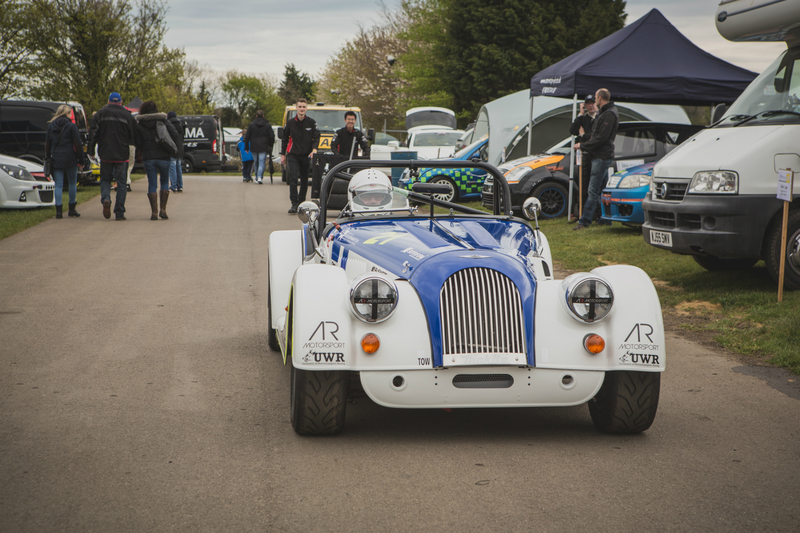 I was pleased with the first race finishing just behind Andrew, I think a couple more laps and I’d have caught right up with him. 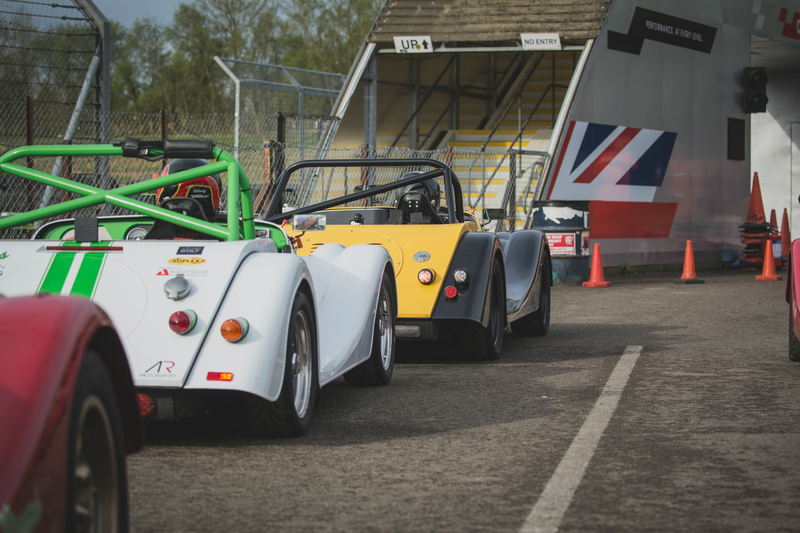 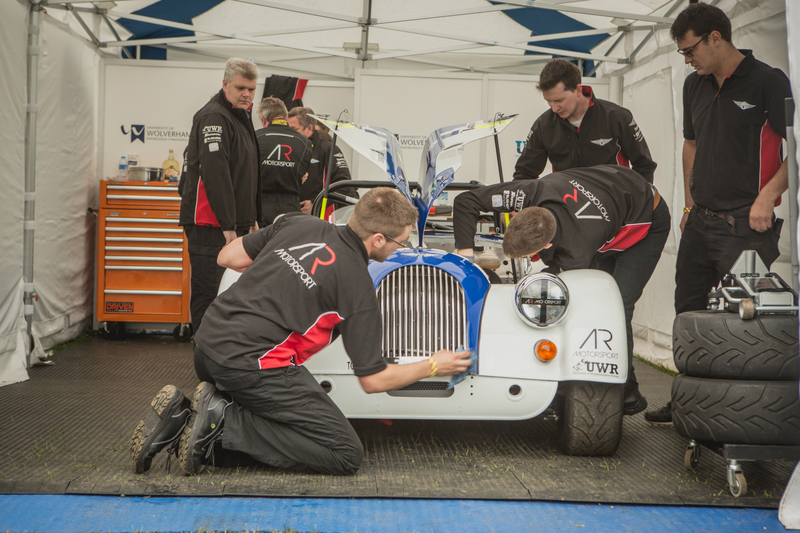 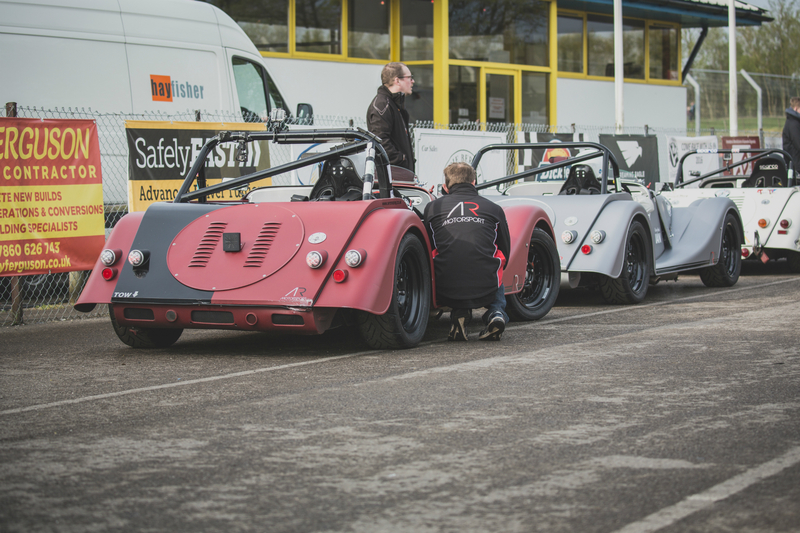 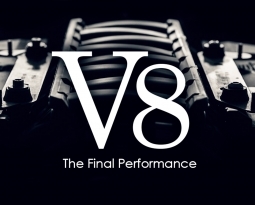 The V6s were running great; it’s fantastic to have a few more of them in the series now, a testament to AR Motorsport. 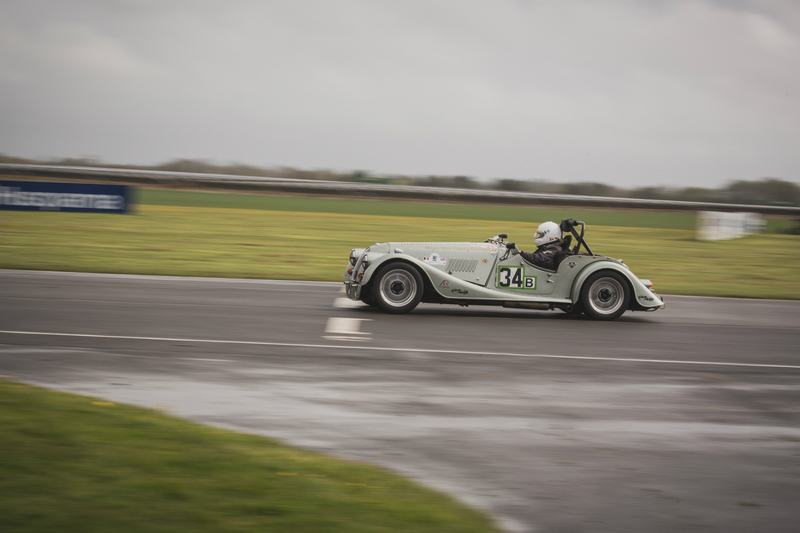 To be honest in the second race I was just holding on, it took 4th gear to get off the line it was so wet. 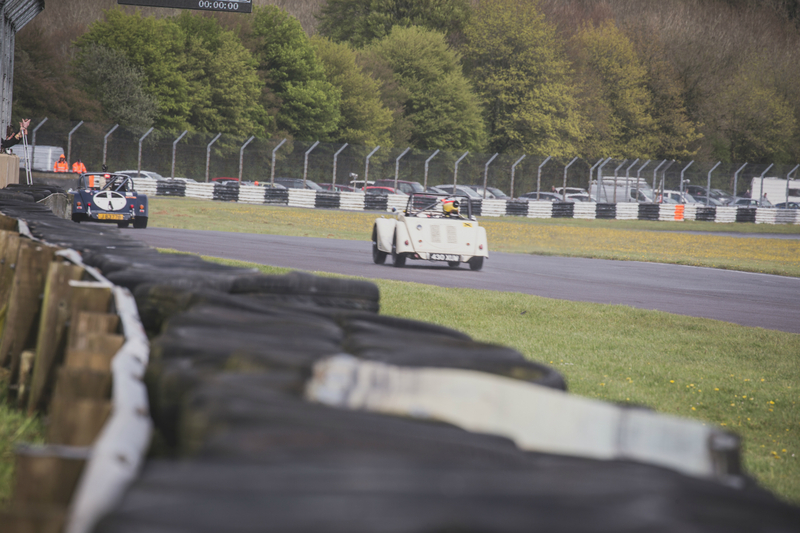 I just left the car in 4th for pretty much the remainder of the race. 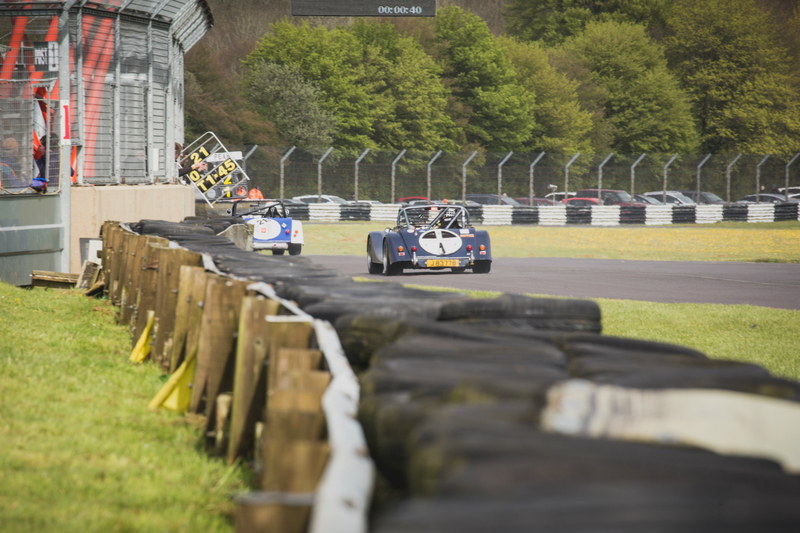 Conditions were interesting to say the least and getting some opposite lock on one of the straights caused me to back off a little, especially when I realised I wasn’t going to catch Elliot. 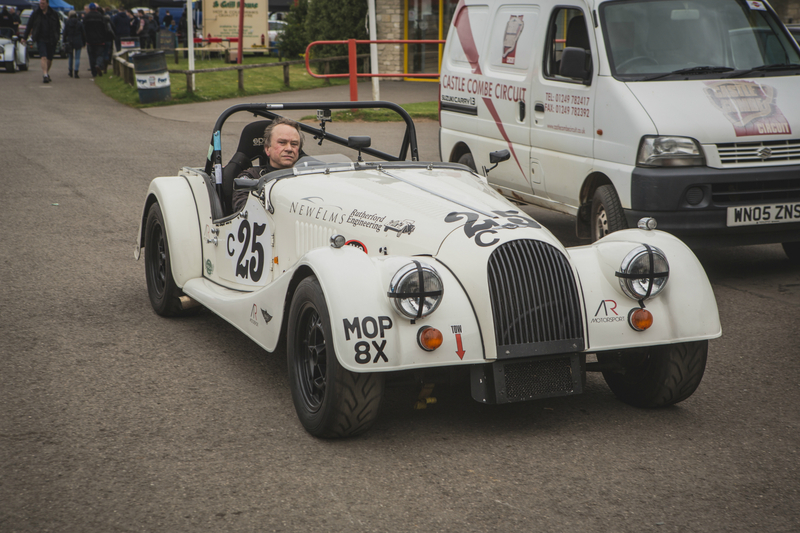 I was pleased with myself for showing some self-restraint, and with MD Steve Morris watching on, there’s not a chance I wanted to come off. 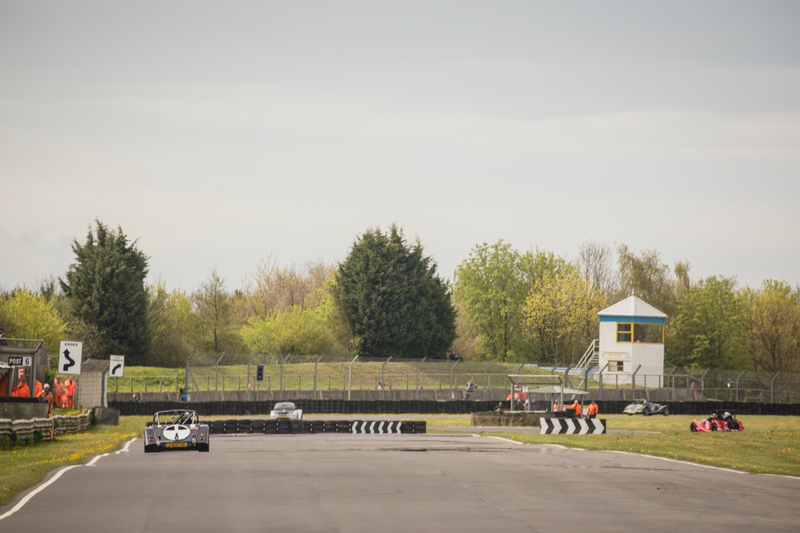 Unfortunately I can’t race at Donington, but very much looking forward to Silverstone GP circuit a few weeks after.